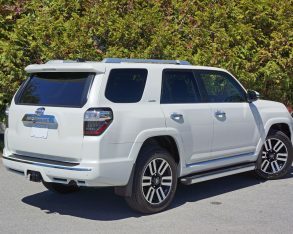 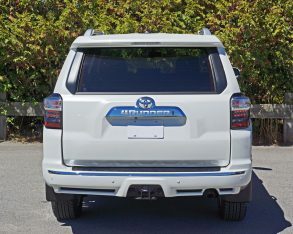 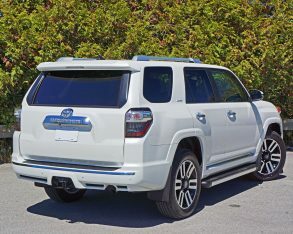 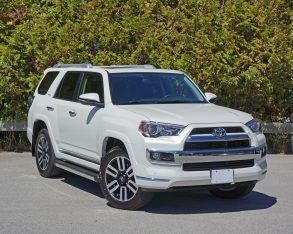 utilities are now much lower, the 4Runner reviewed here one of just a handful of body-on-frame 4x4s still available, yet the 4,022 Canadian-spec models sold last year represented the model’s best volume in more than a decade, while Toyota’s US division enjoyed even better per capita sales of 76,906 units during the same 12 months. 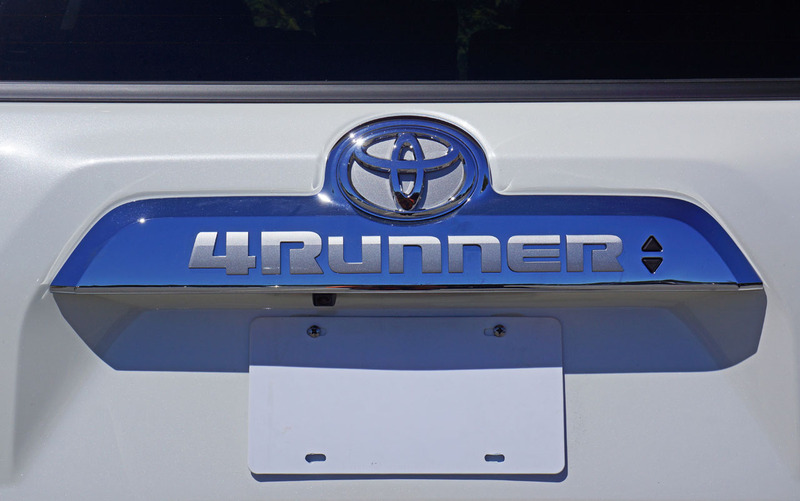 What’s more, this more than decent volume appears to be on an upswing for the first half of 2015 with 2,440 4Runners already down the road. 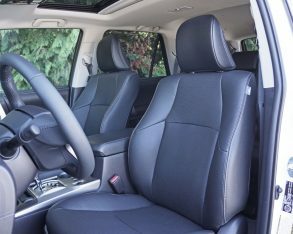 Traverse CUVs Chevy managed to peddle let alone the 1,779 Tahoes bowtie buyers bought, slaughters Mazda’s similarly sized CX-9 that only found 1,543 buyers, and while Dodge’s super cheap Journey found 24,715 new homes (it’s half the price of a 4Runner) its Durango (that competes directly against the 4Runner) only managed 2,977 sales last year. 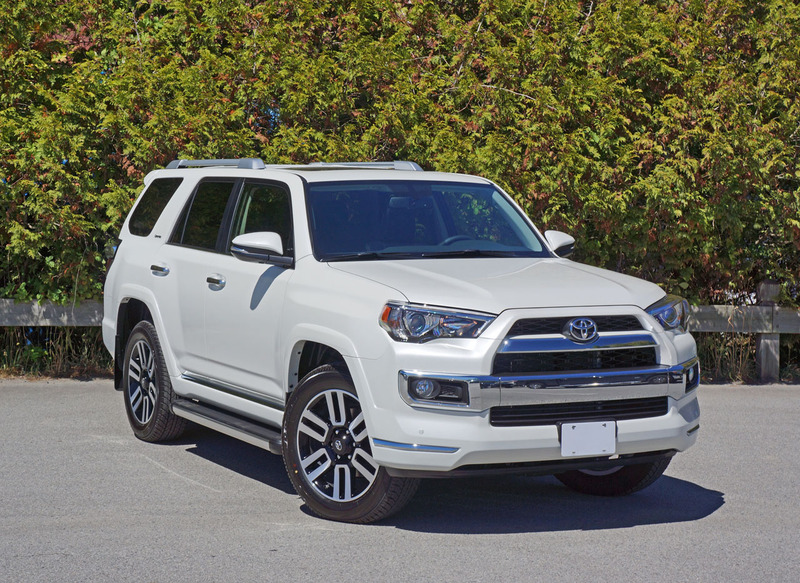 So Toyota can be proud of how well its mid-size 4×4 is doing in this ever-changing CUV/SUV market, especially considering the basic concept of the 4Runner hasn’t changed all that much since it was built off the back of a Tacoma pickup truck 31 years ago. 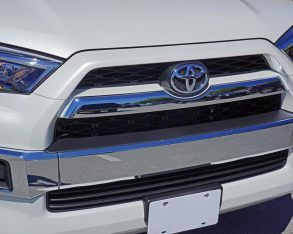 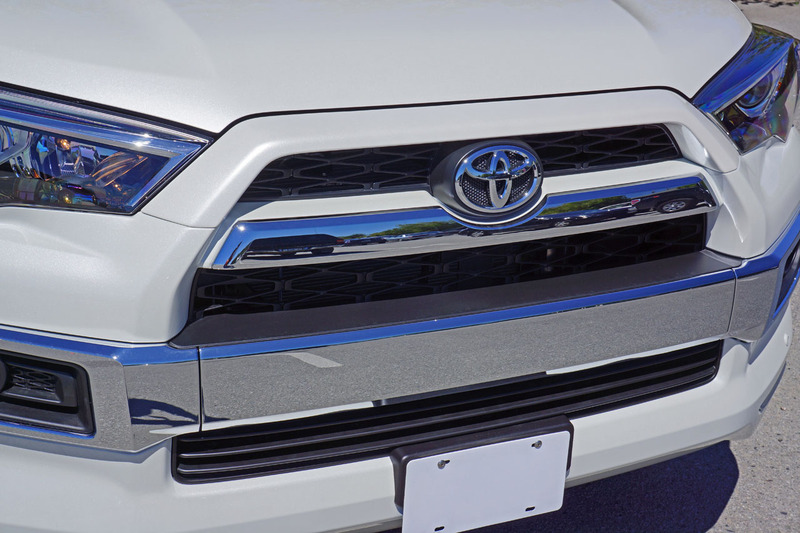 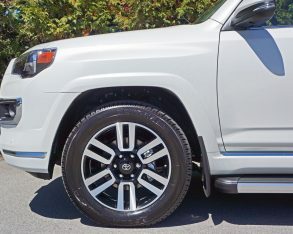 difficult to find the similarities between the current Tacoma and 4Runner now, the latter based on the same tried and true undercarriage as the much pricier Lexus GX, which itself started off as Toyota’s Land Cruiser Prado. 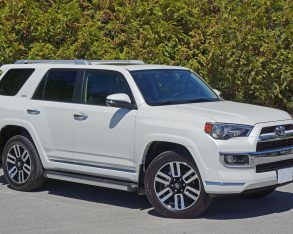 Putting 4Runner in the same sentence with Lexus and Land Cruiser is praise indeed, the former a luxury leader and the latter legendary for off-road prowess, but it truly deserves to be recognized alongside this lofty duo. 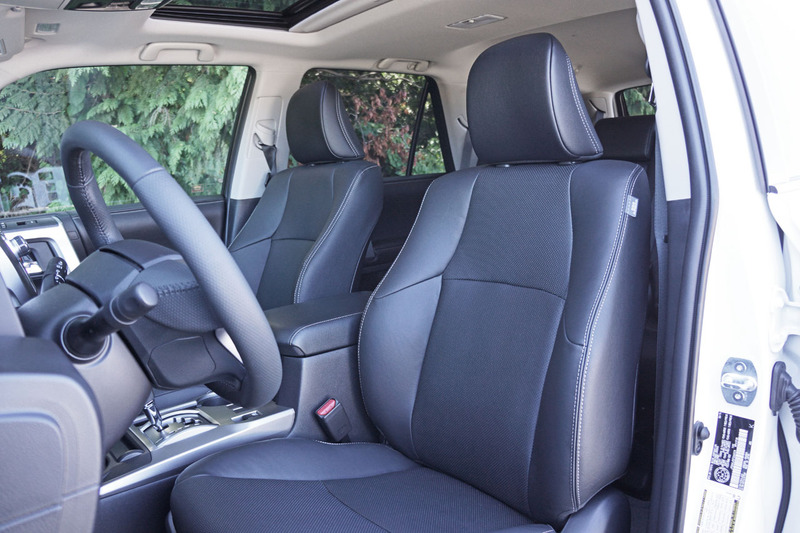 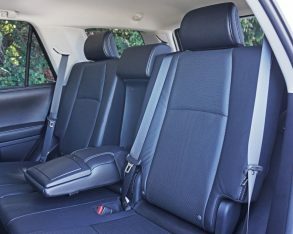 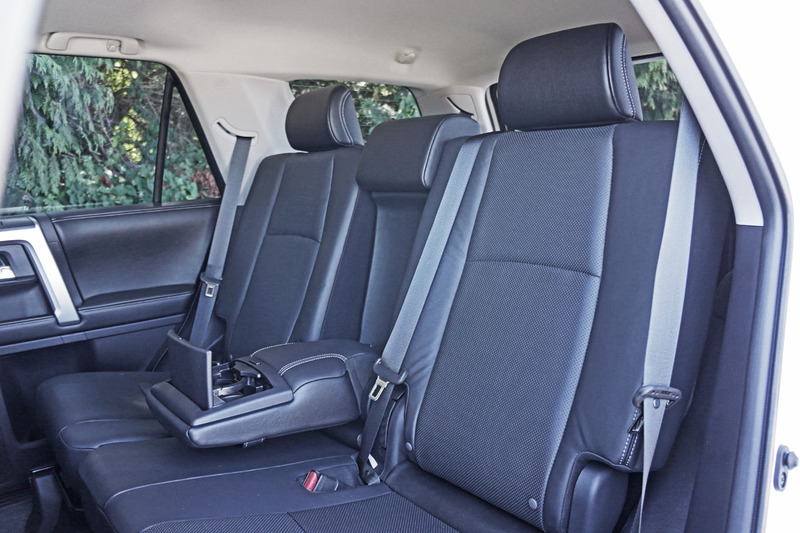 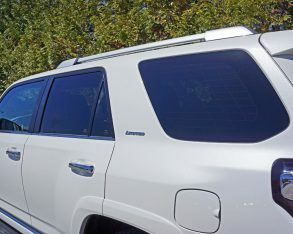 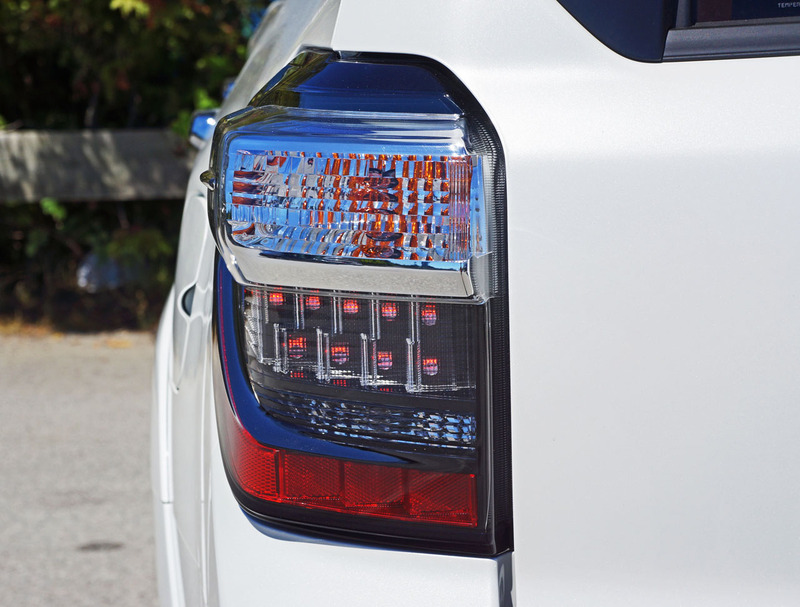 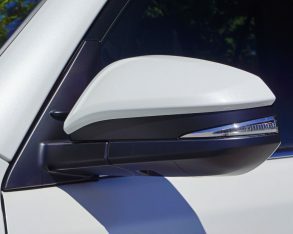 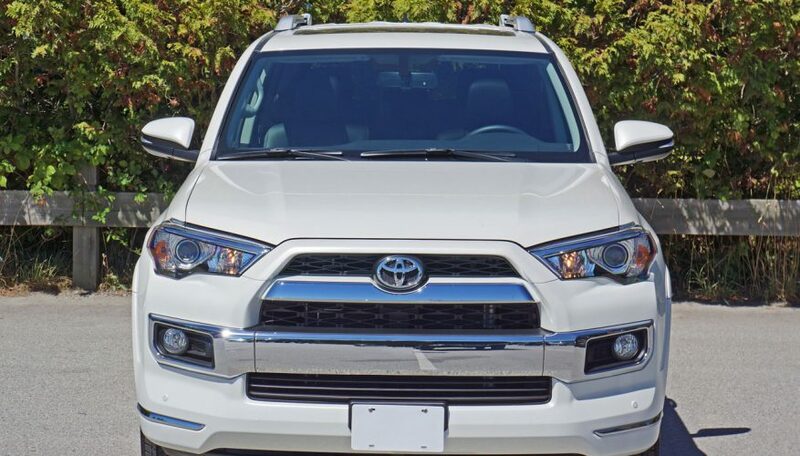 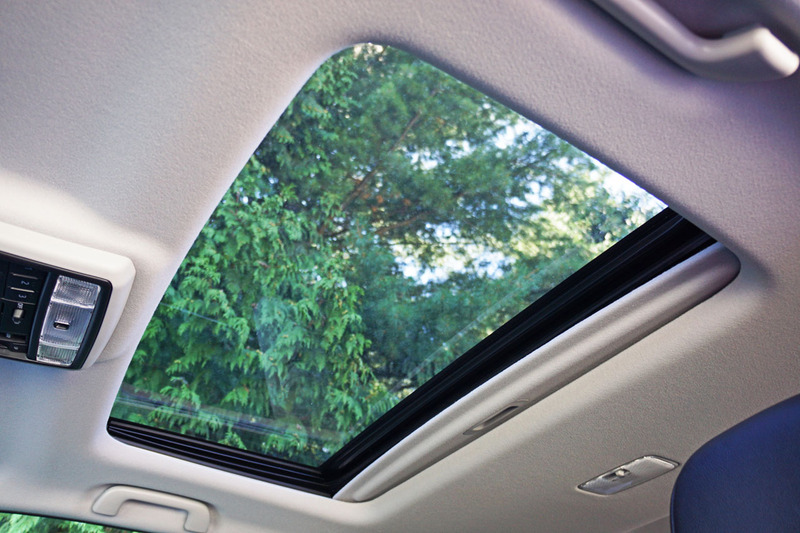 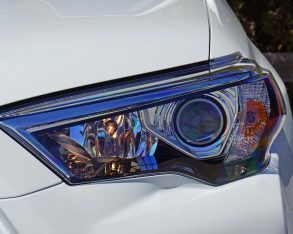 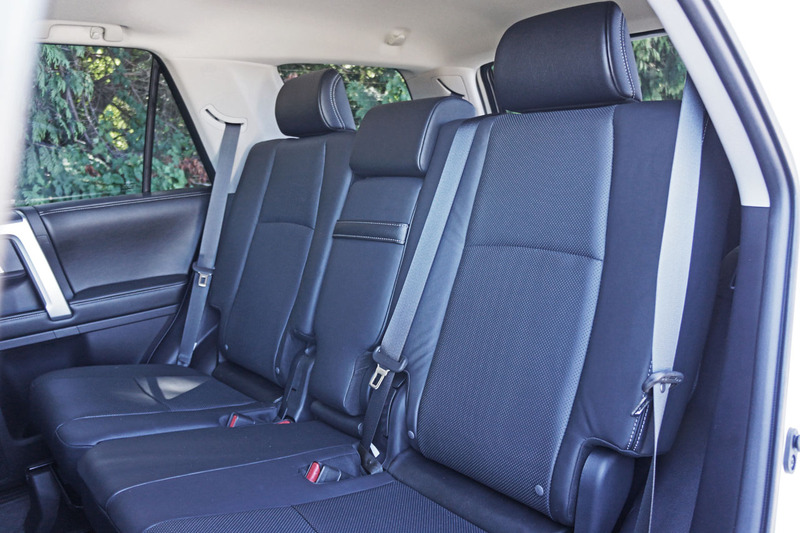 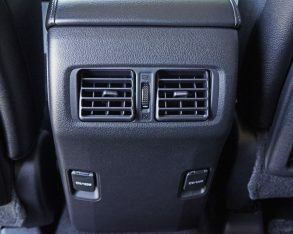 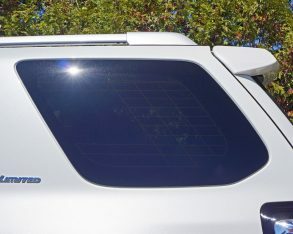 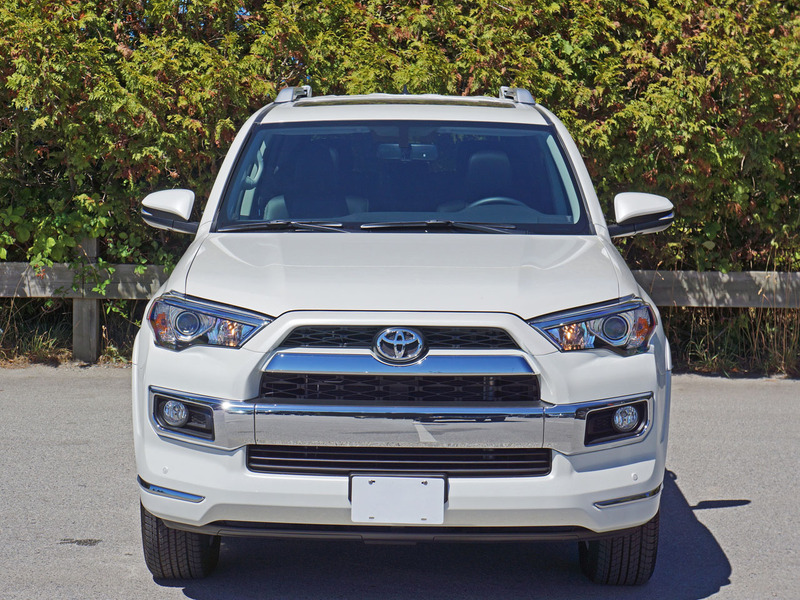 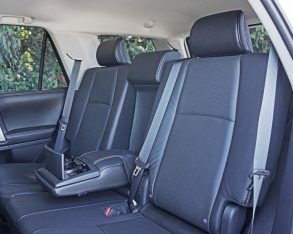 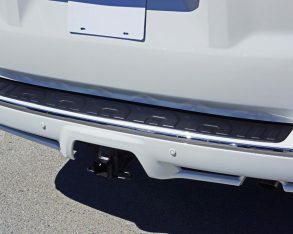 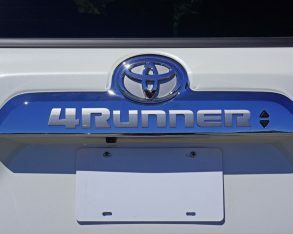 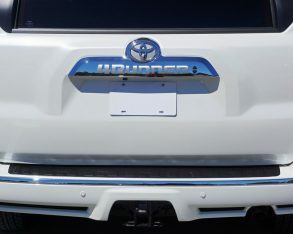 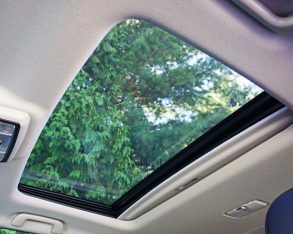 The 4Runner actually has a highly respected cachet all it’s own, a premium appeal that attracts a wealthier demographic than you might realize, and my tester’s luxury-lined Limited trim was designed to appeal to just such a buyer. 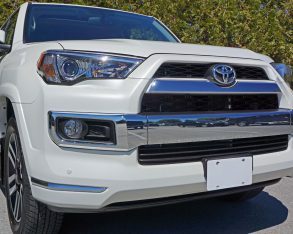 Limited is much more refined and easily more palatable to the country club set than the rough and ready Trail Edition or the similar in-your-face look of the base SR5. 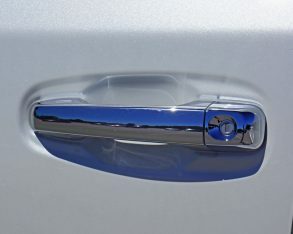 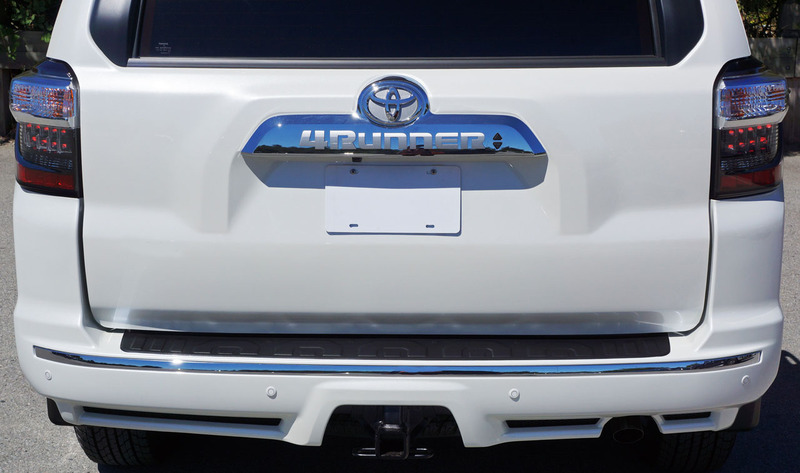 nameplate is done out in satin silver while sitting atop a chromed rear applique. 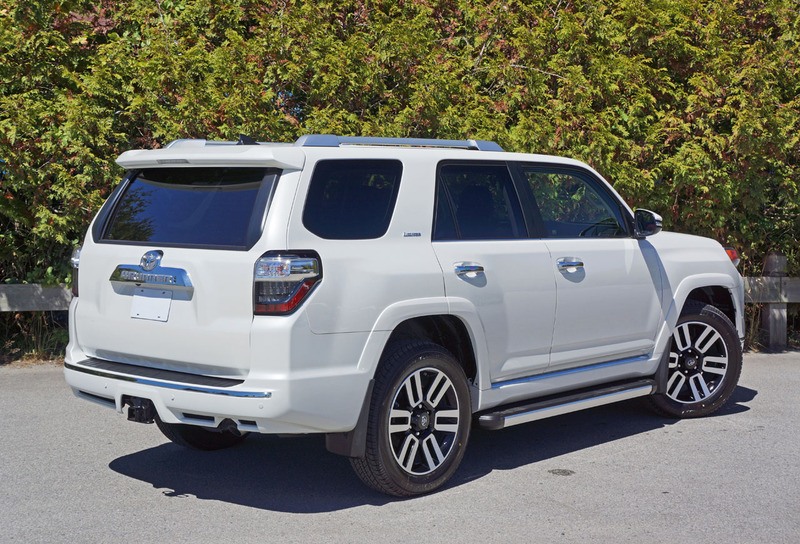 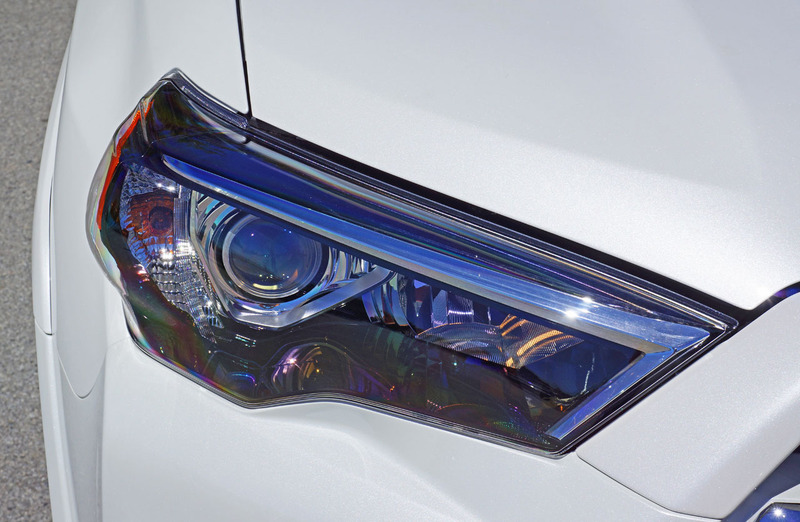 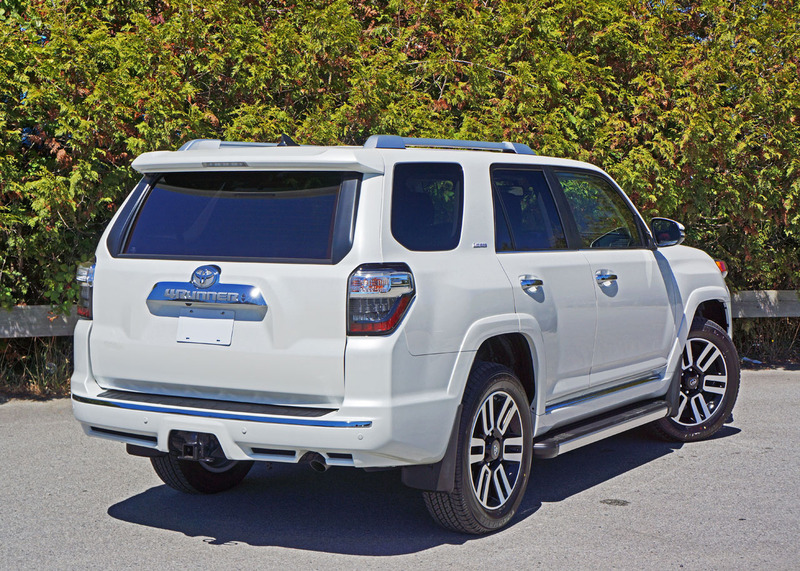 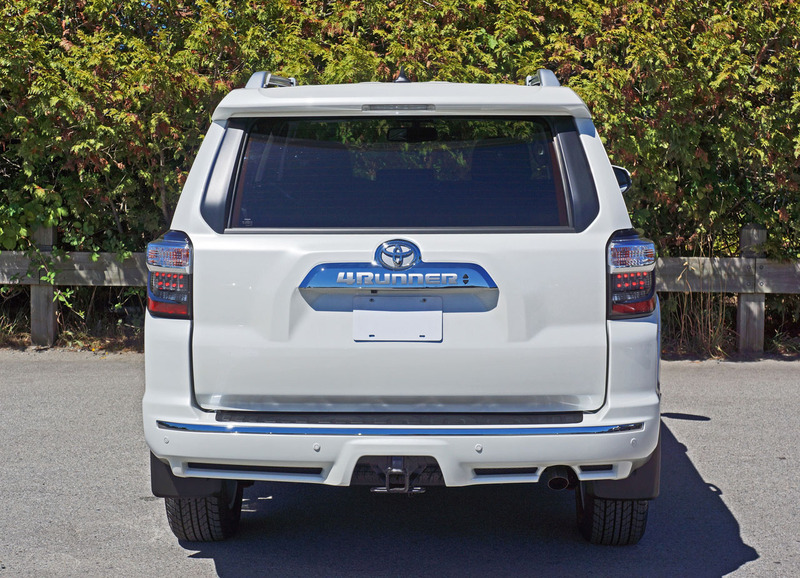 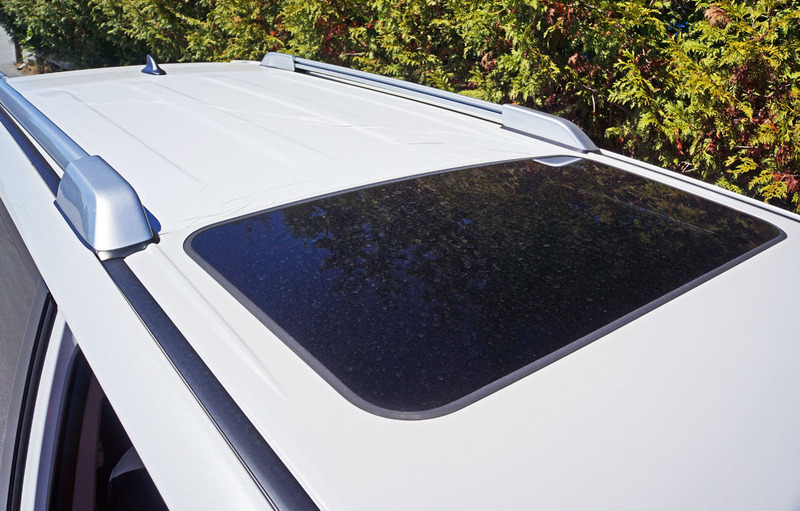 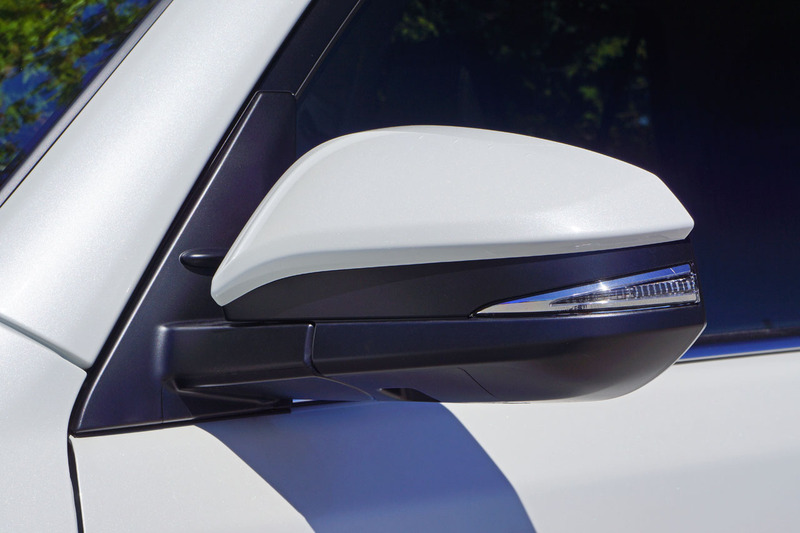 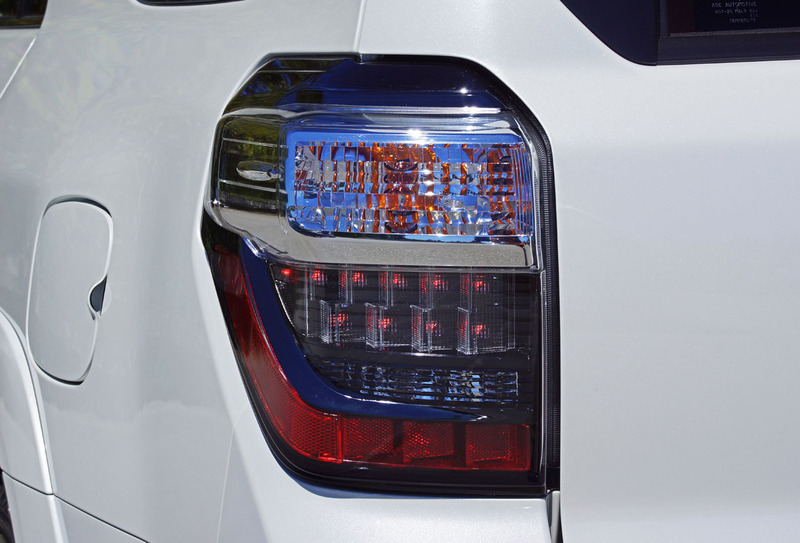 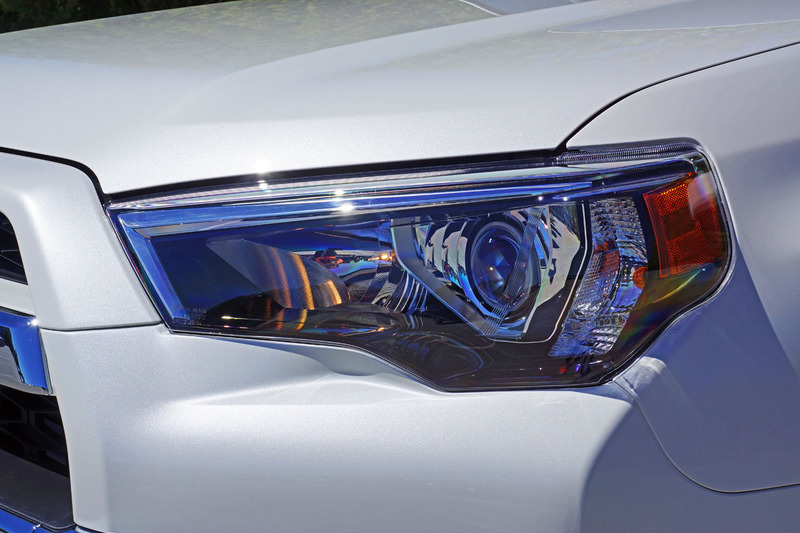 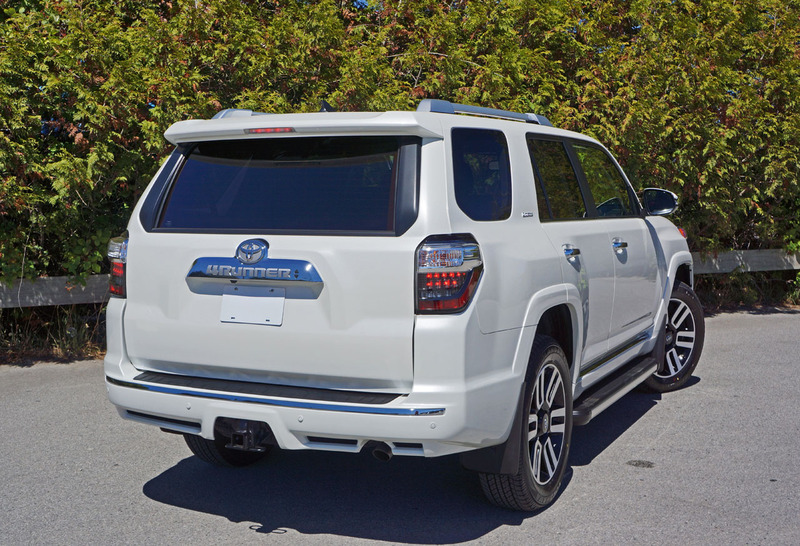 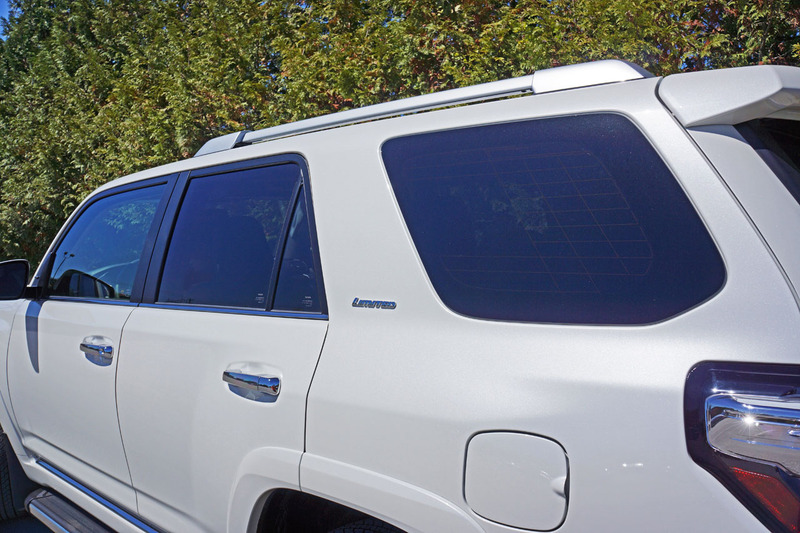 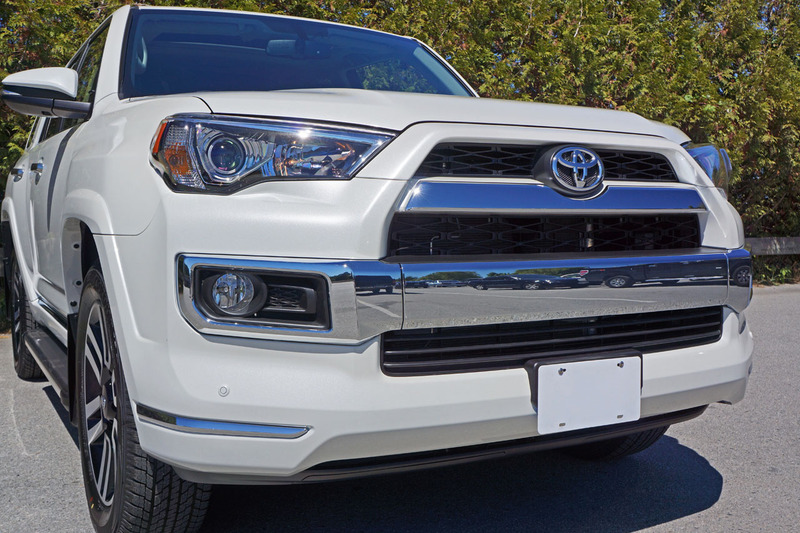 All-round the Limited limits the lesser 4Runner’s bold and brash side and replaces it with a more polished and sophisticated design. 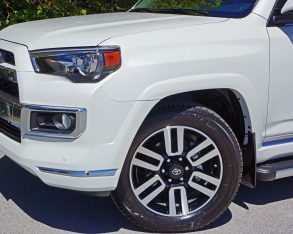 it adds yet more impressive running gear, such as an X-REAS sport suspension, full-time 4WD, and those 20-inch aluminum rims I just mentioned. 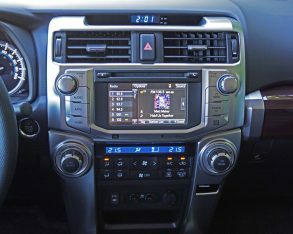 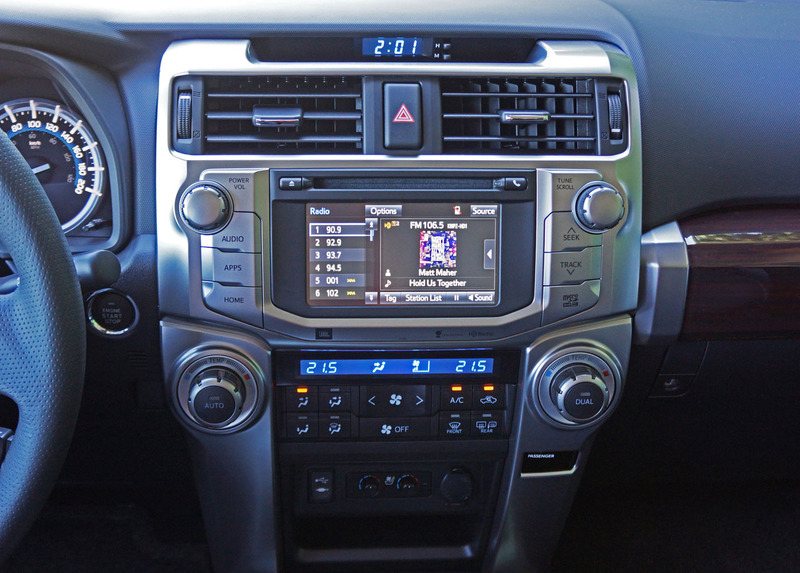 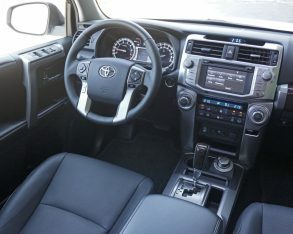 one was capable of the same kind of heavy-duty mud-slinging, rock-crawling and dirt flinging that I experienced in the 2010 version Toyota let us play with during its introduction. 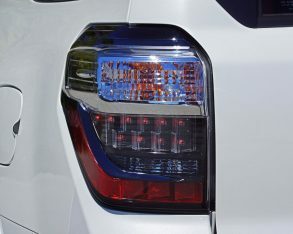 comfortable characters more easily shine through. 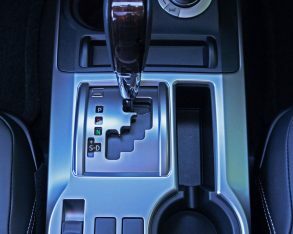 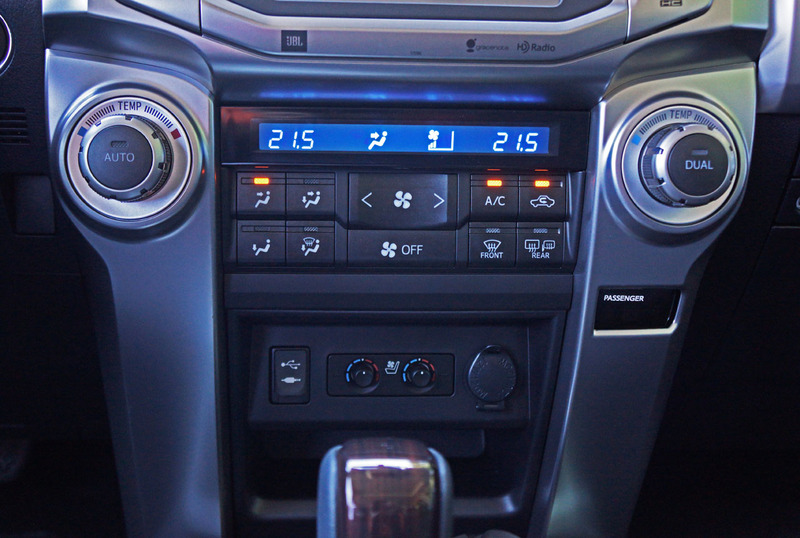 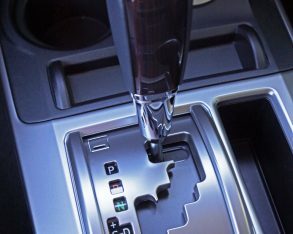 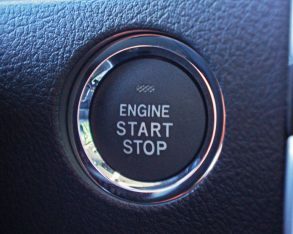 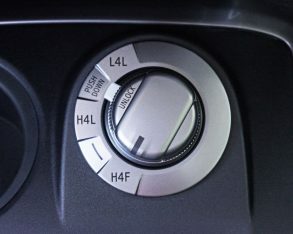 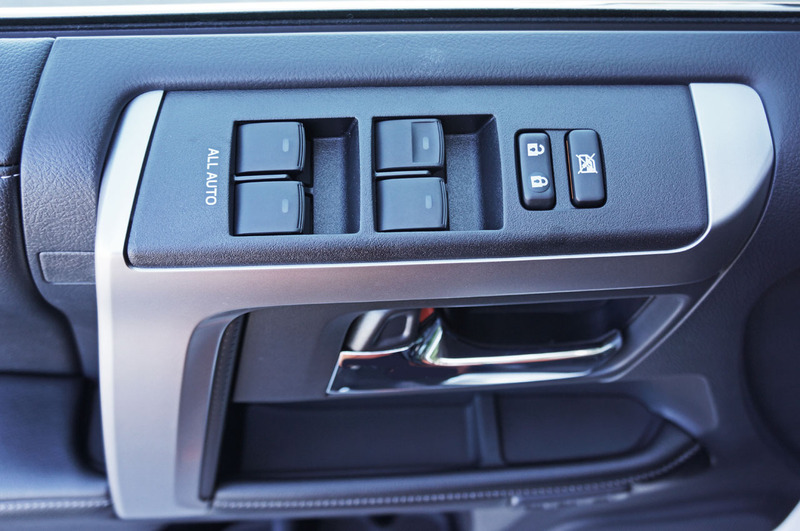 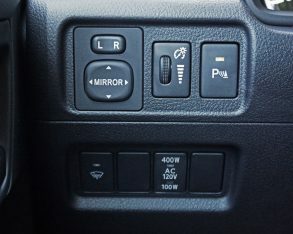 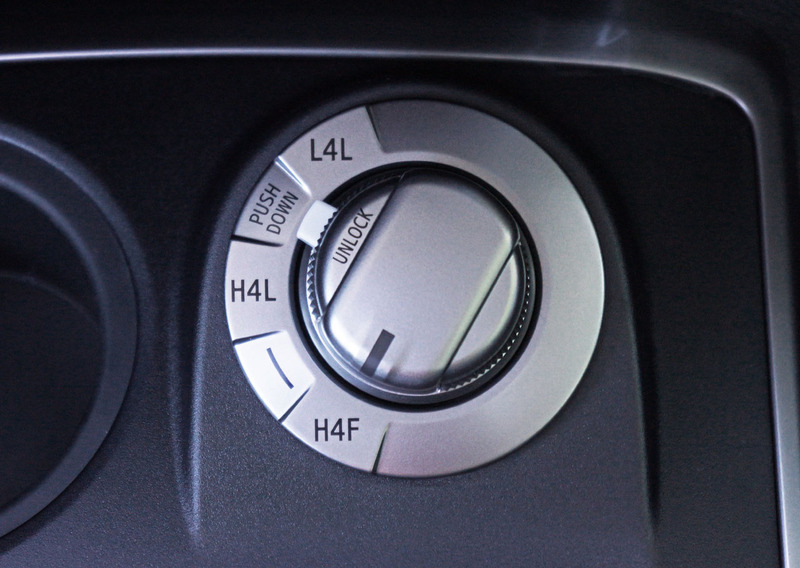 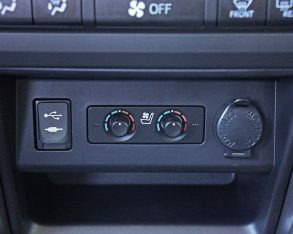 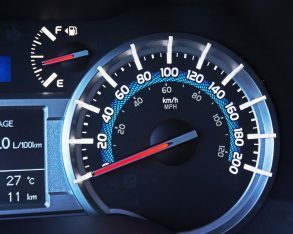 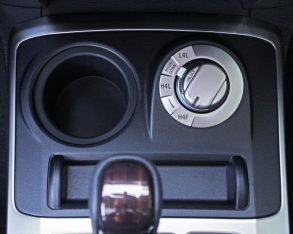 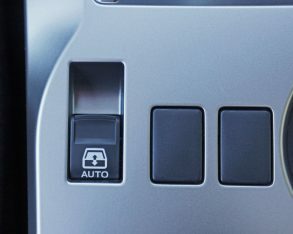 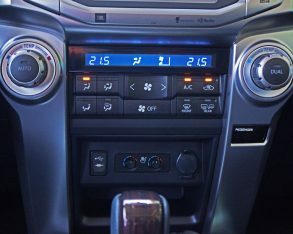 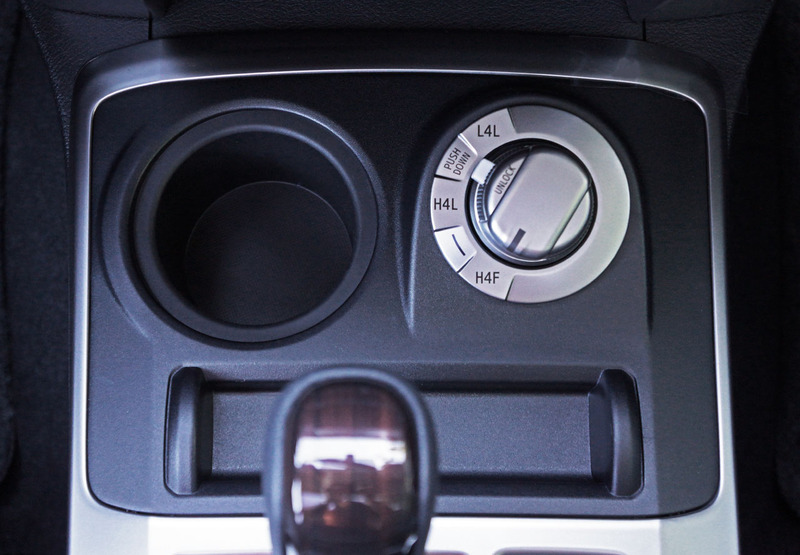 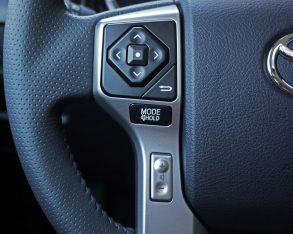 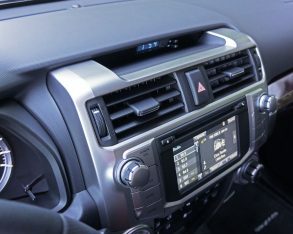 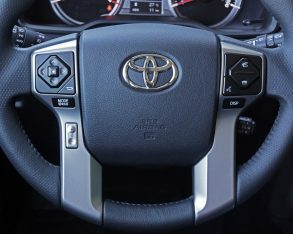 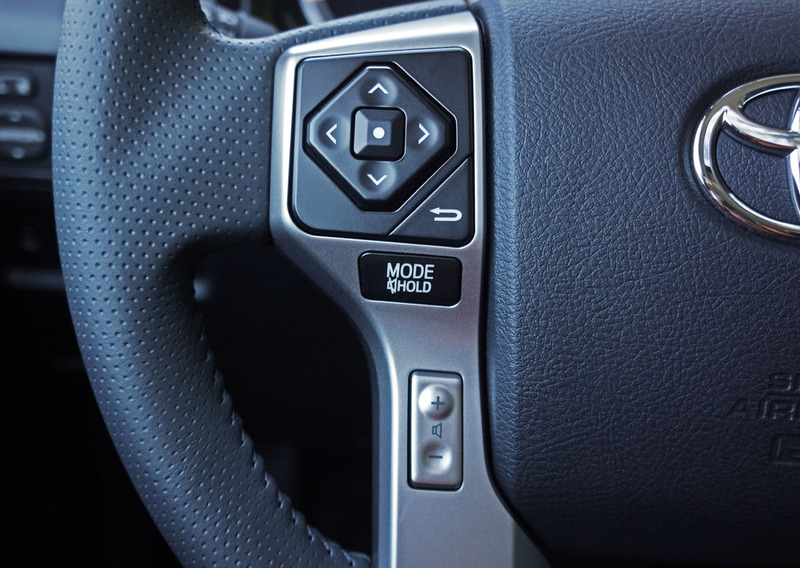 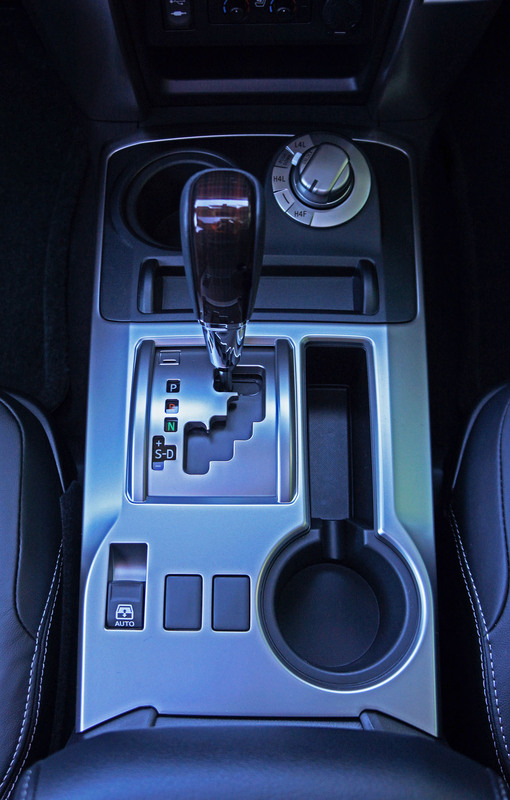 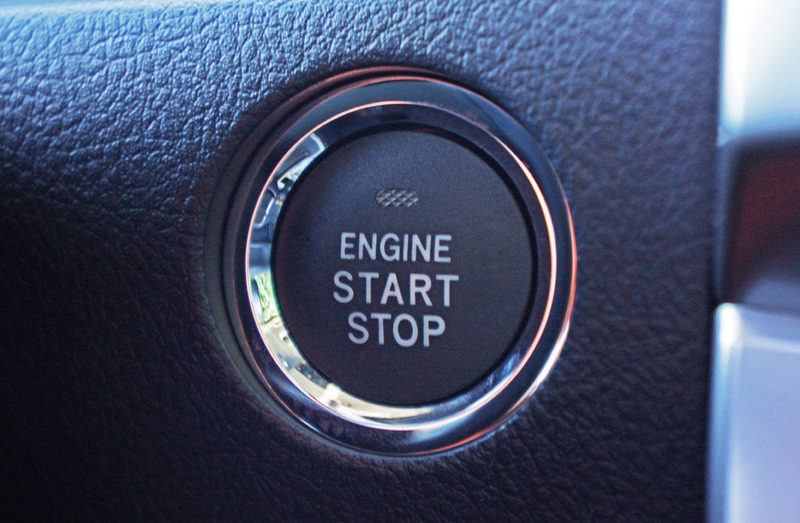 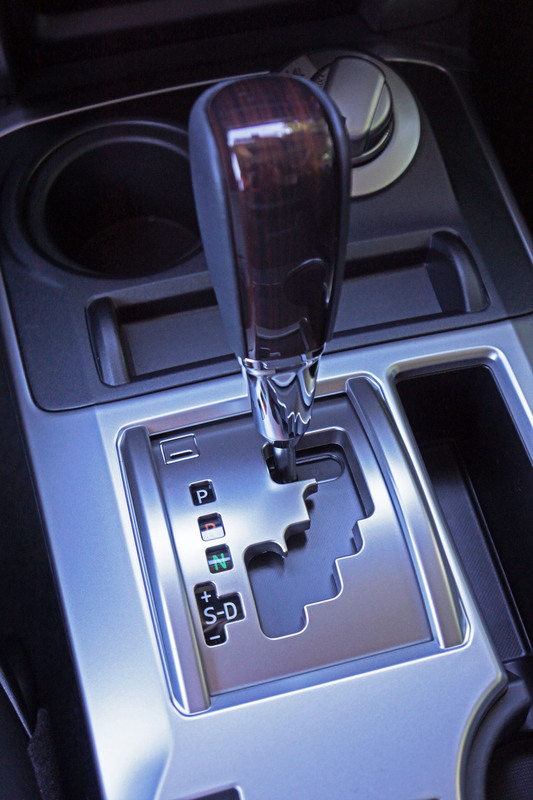 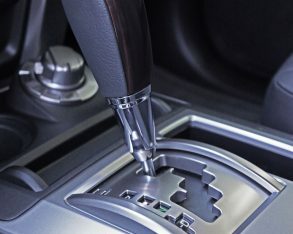 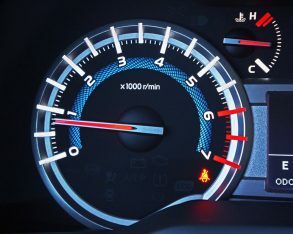 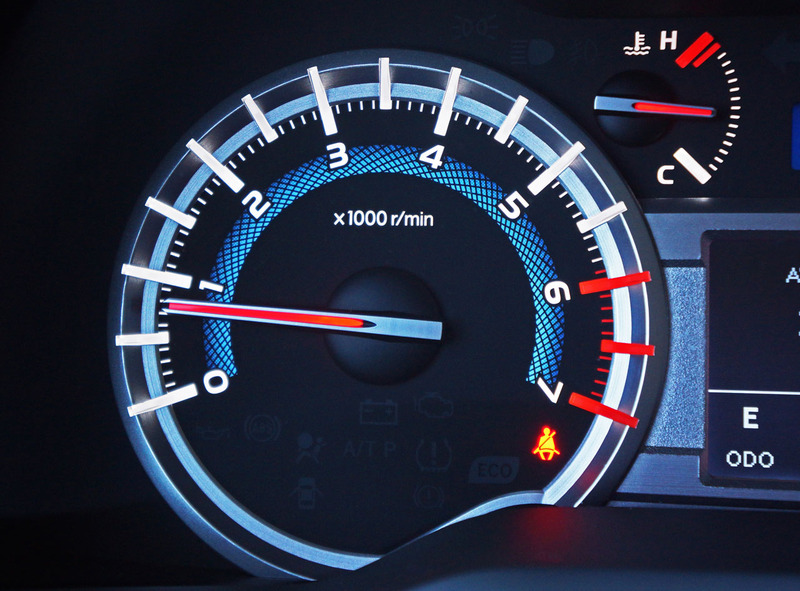 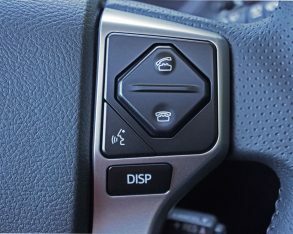 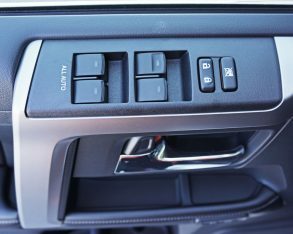 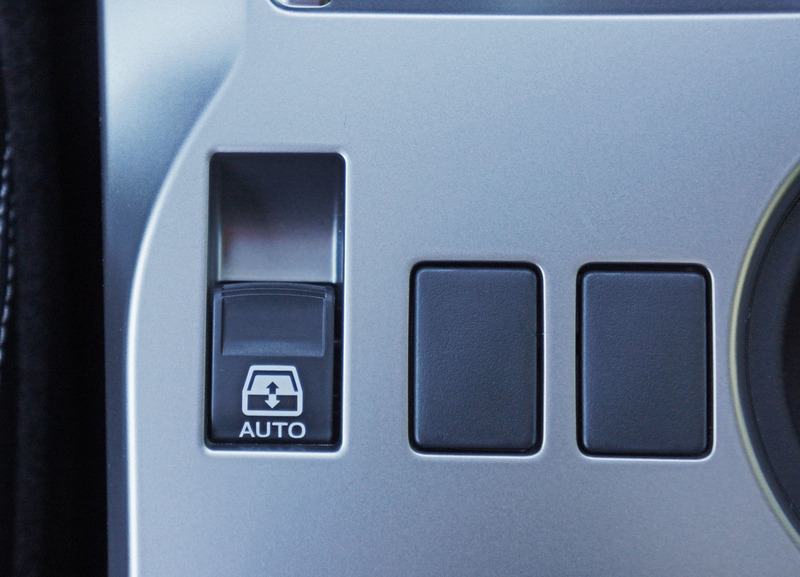 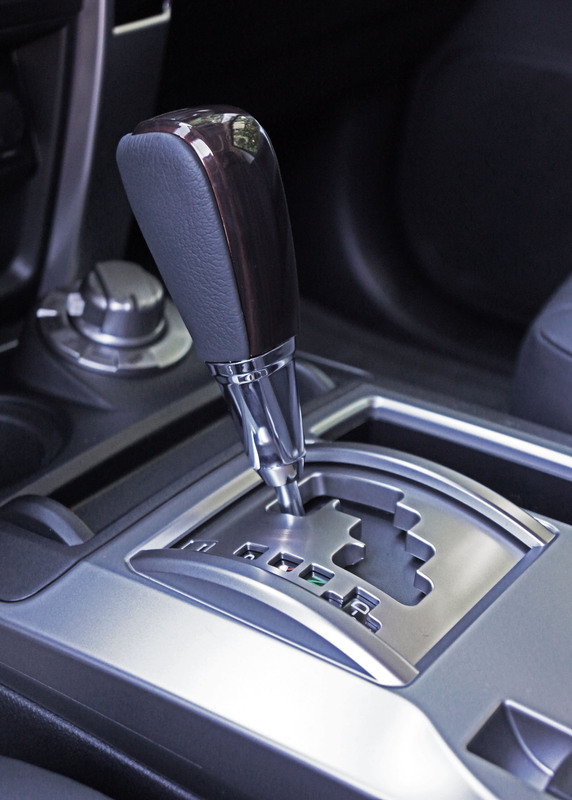 The 4Runner still uses a five-speed automatic transmission, which on paper might not appear as slick as a six-speed or one of the eight- or even nine-speed gearboxes currently in vogue, but some of these latest-tech multi-speed units have caused their automakers and more importantly their customers problems, whereas the 4Runner’s five-speed autobox is a well-proven commodity boasting rugged dependability, which is exactly what I want to rely on when umpteen miles into the wilderness, let alone running errands around town. 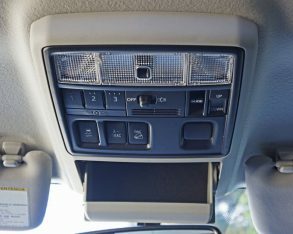 satellite radio, plus dual-zone automatic climate control, proximity-sensing access with pushbutton ignition, puddle lamps, automatic headlamps, front and rear parking sensors, a nicely laid out overhead console with a handy sunglasses holder, a powered moonroof, powered windows at all seating positions, of course, as well as a powered rear window just like station wagons of yore, while its safety equipment list includes all the usual airbags plus driver and front passenger knee blockers, four-wheel disc brakes with ABS, electronic brake-force distribution, and emergency brake assist, traction and stability control, plus Toyota’s Smart Stop Technology (SST) that reduces power to the engine during braking. 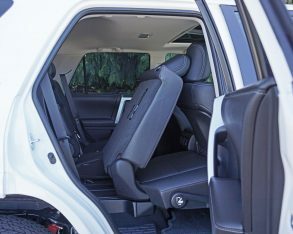 all models need to have a freight and pre-delivery prep charge of $1,730 added to the bottom line. 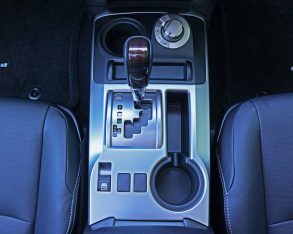 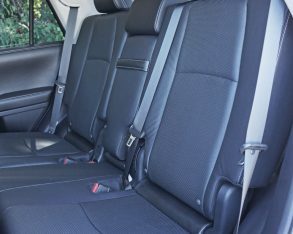 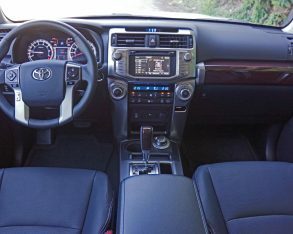 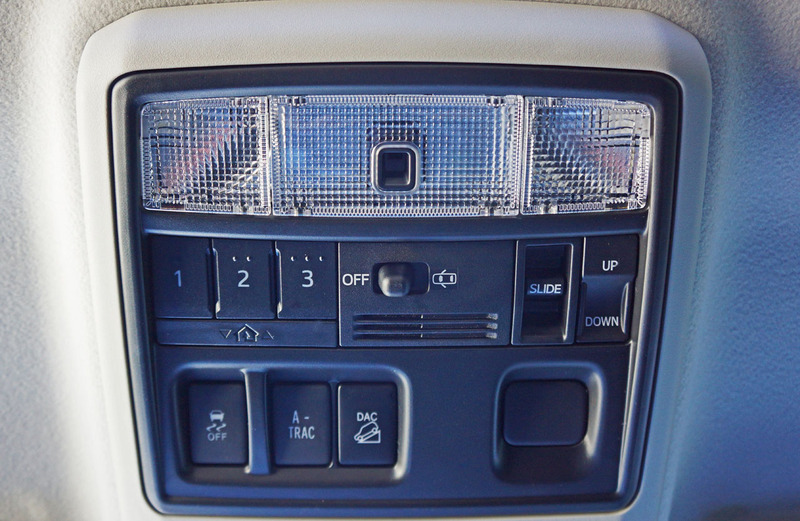 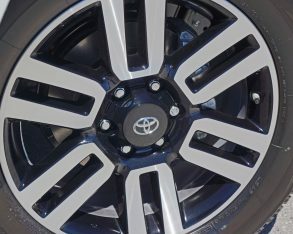 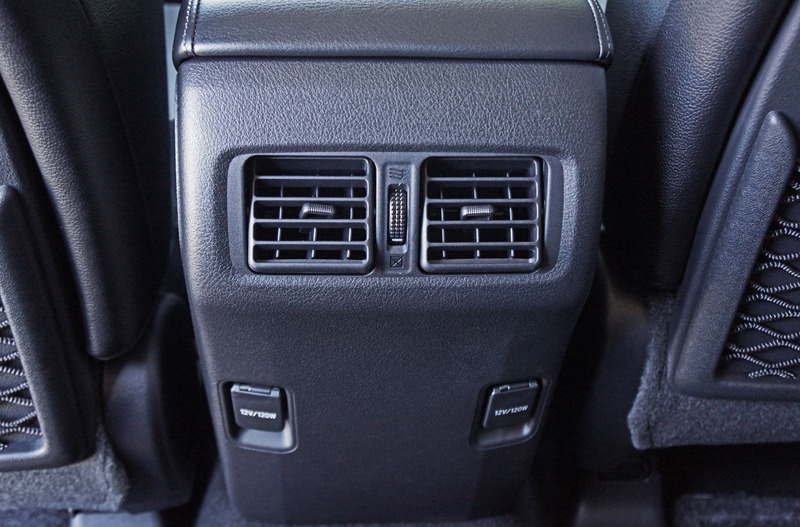 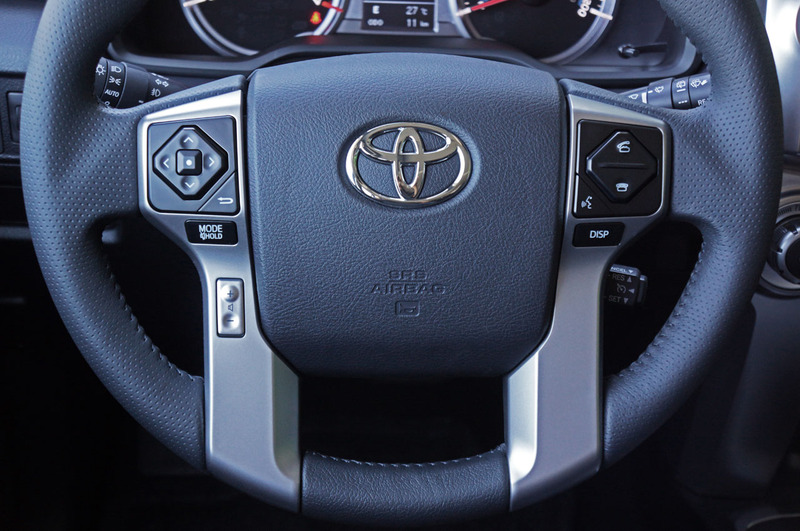 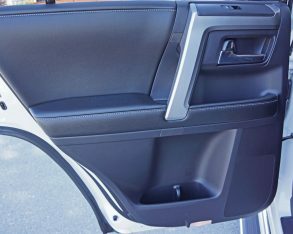 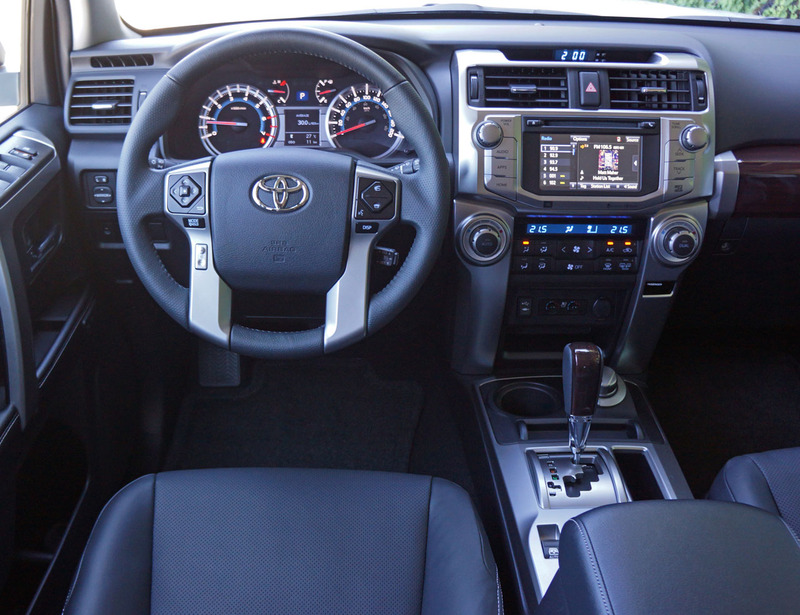 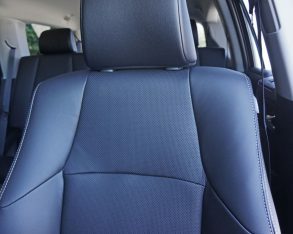 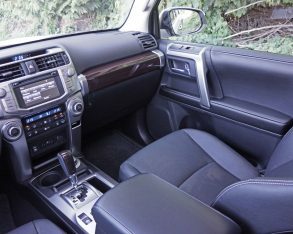 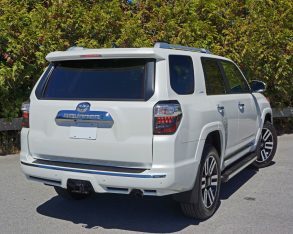 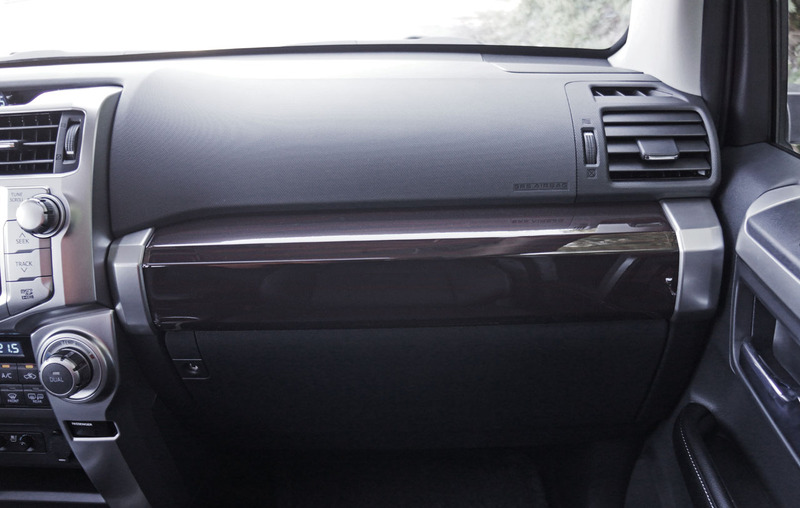 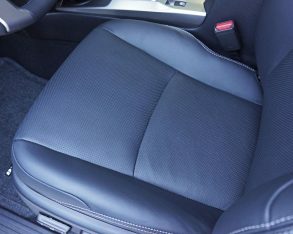 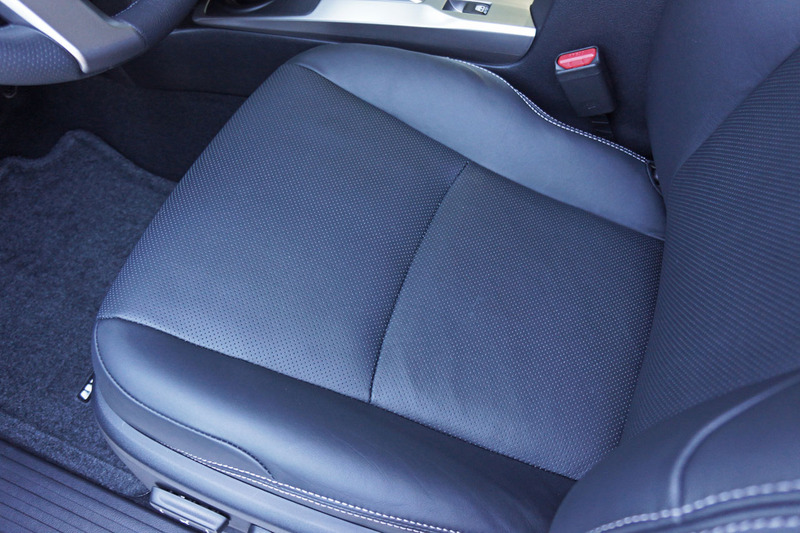 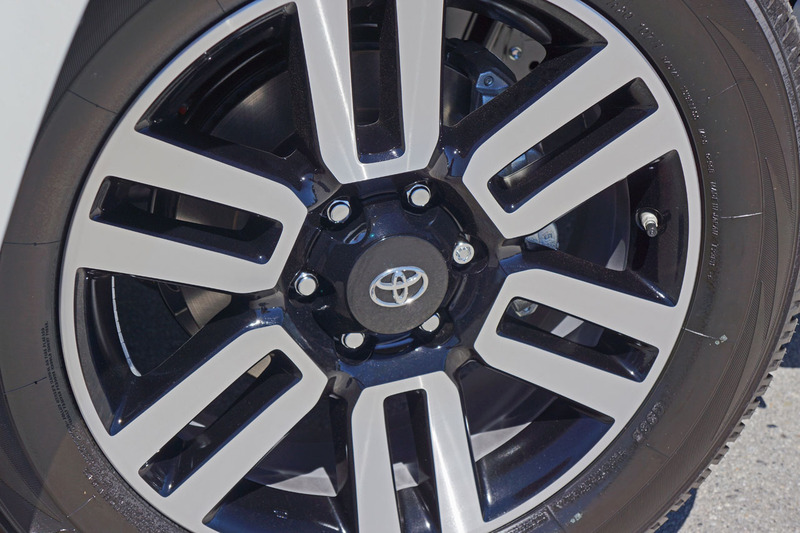 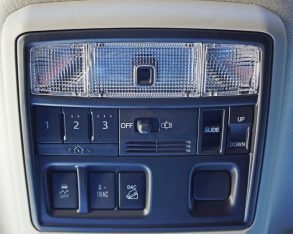 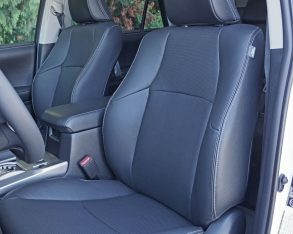 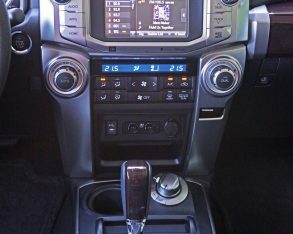 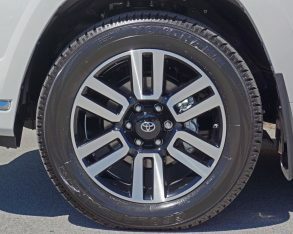 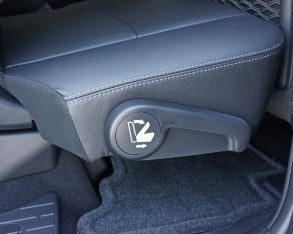 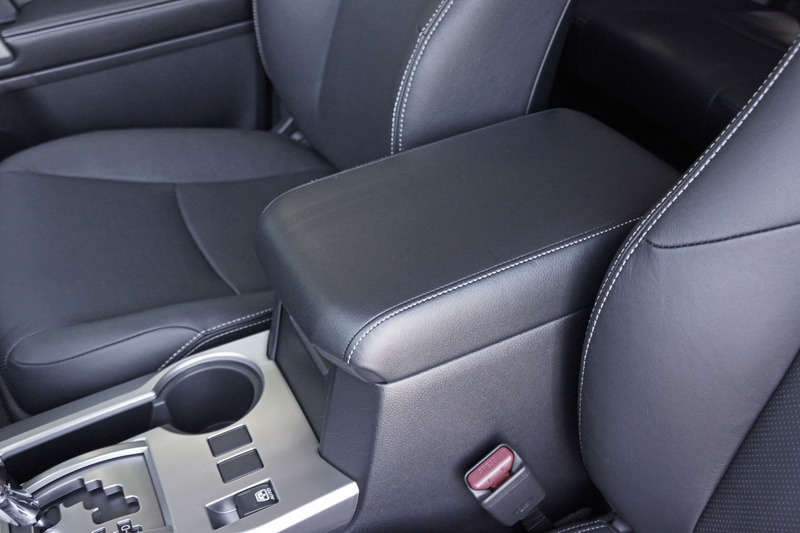 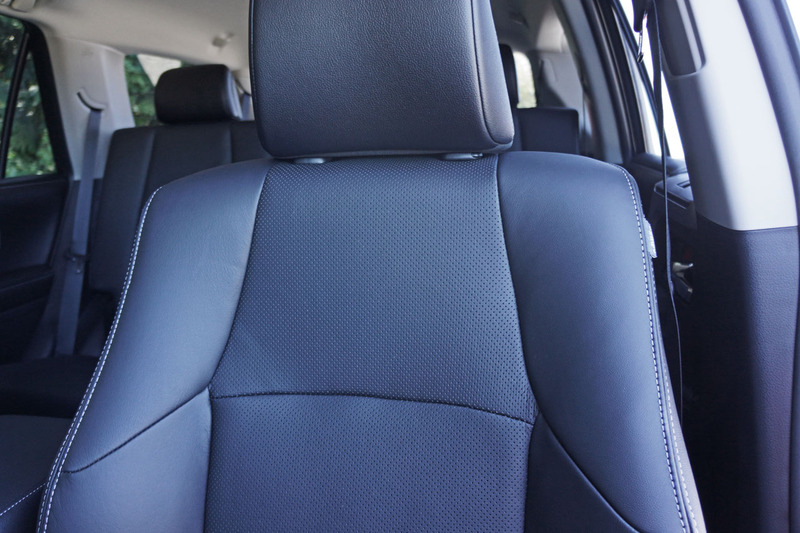 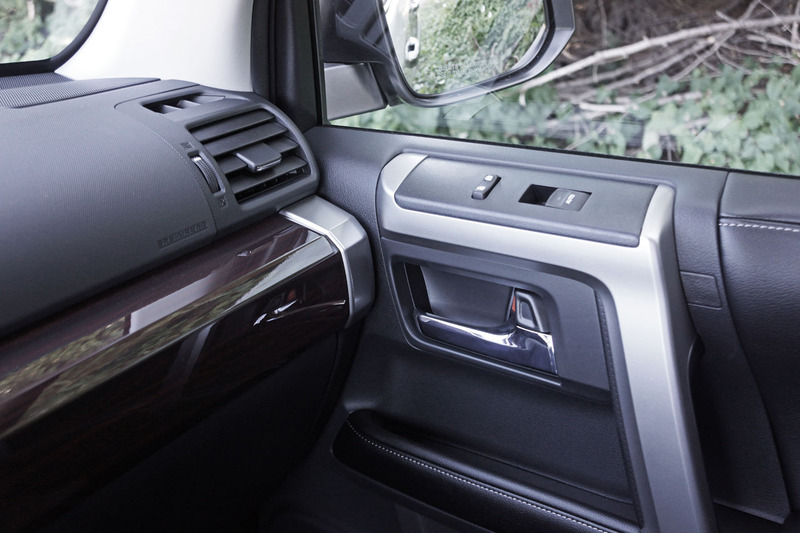 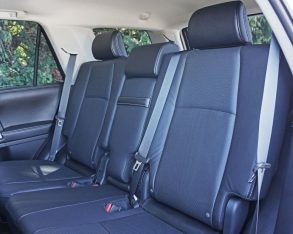 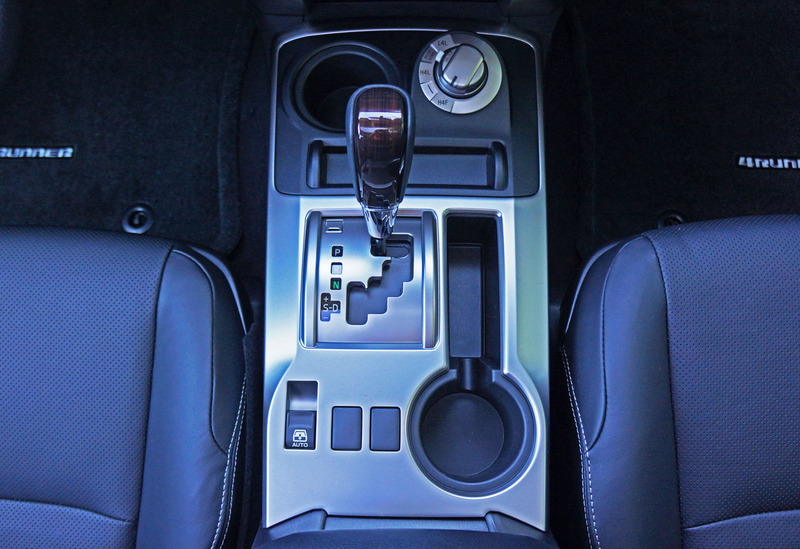 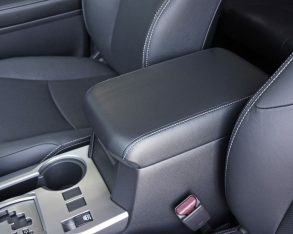 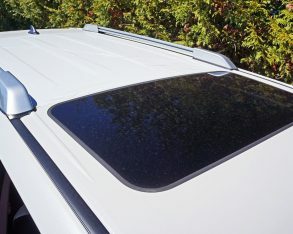 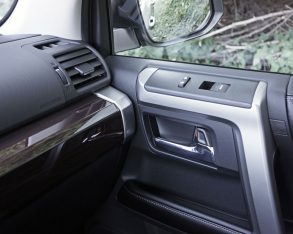 My tester required $255 for its Blizzard Pearl paint, and while Redwood leather was available, Toyota finished its interior in traditional black hides. 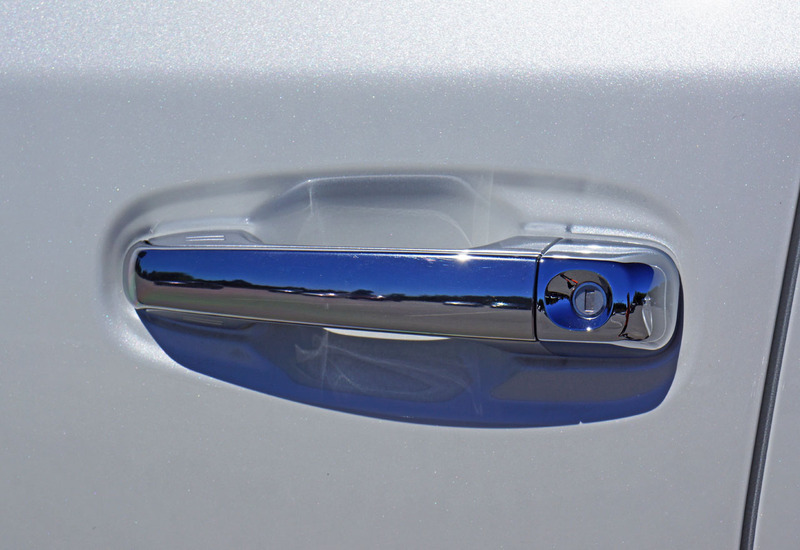 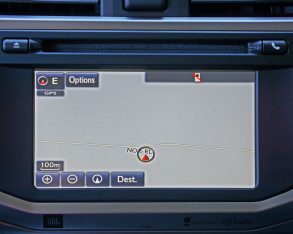 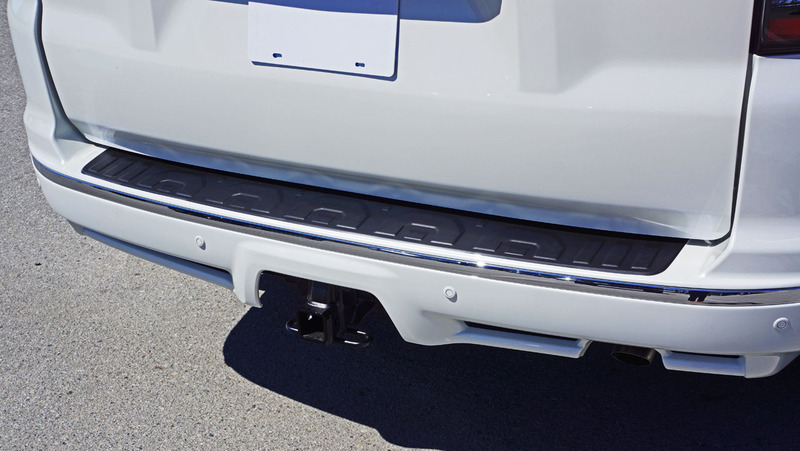 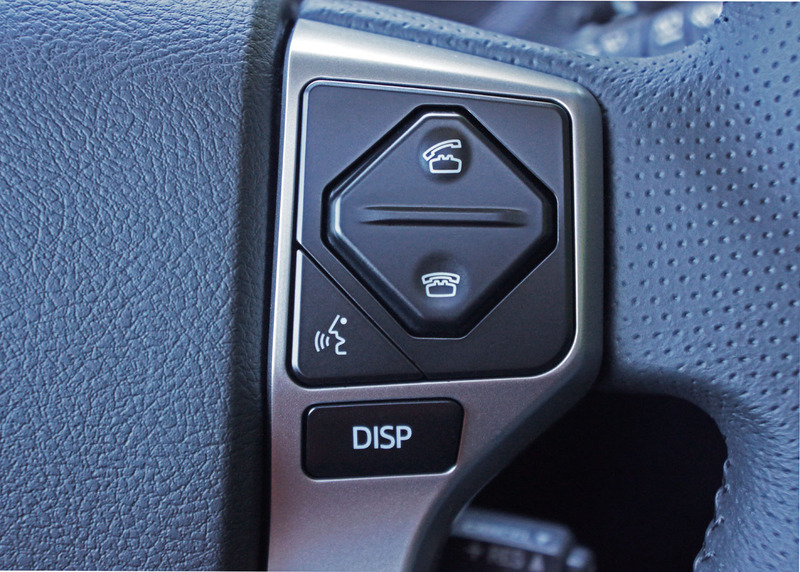 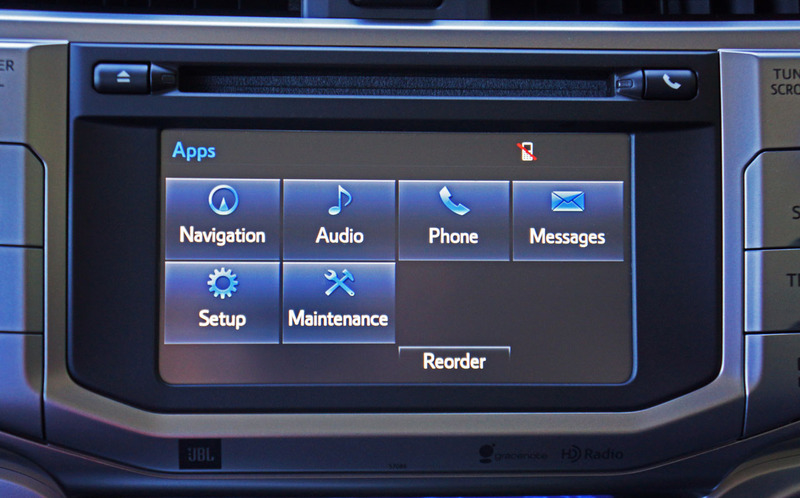 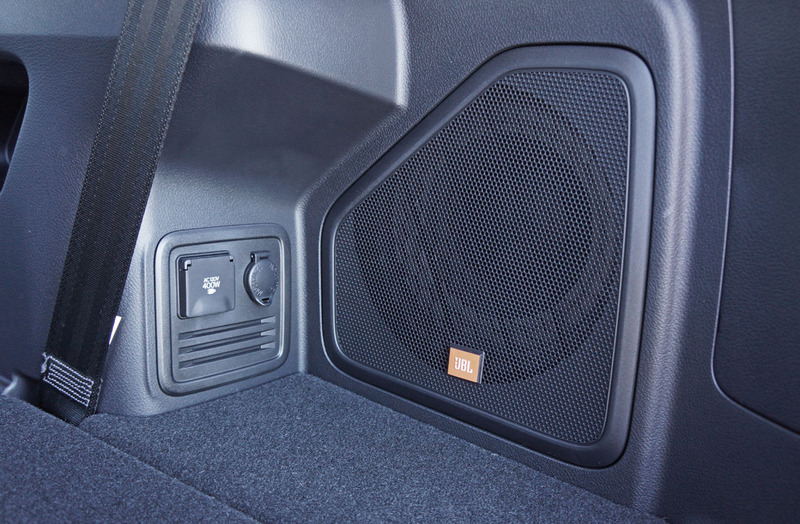 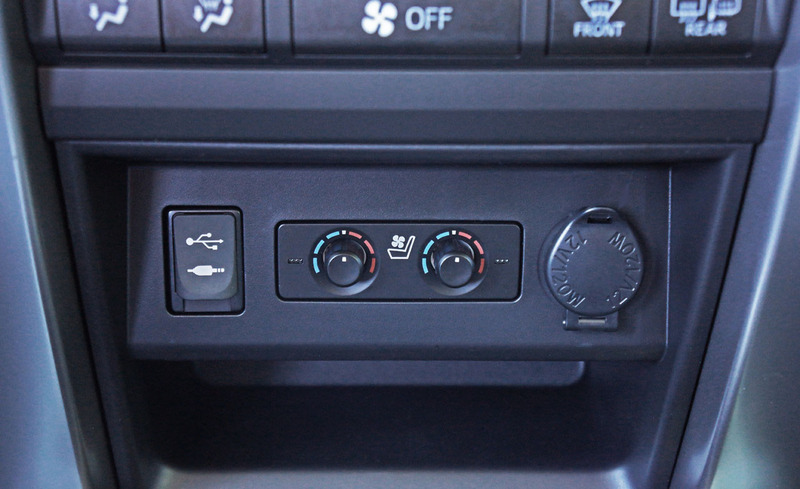 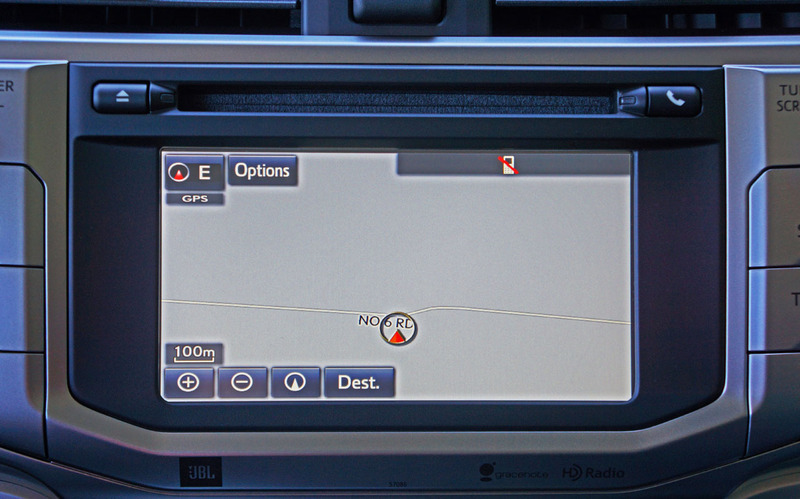 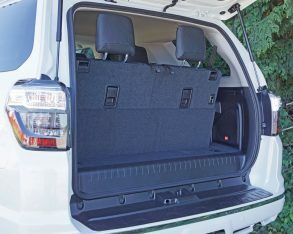 No additional factory options are available, but a long list of useful accessories can be had from your local dealer. 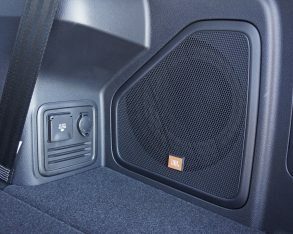 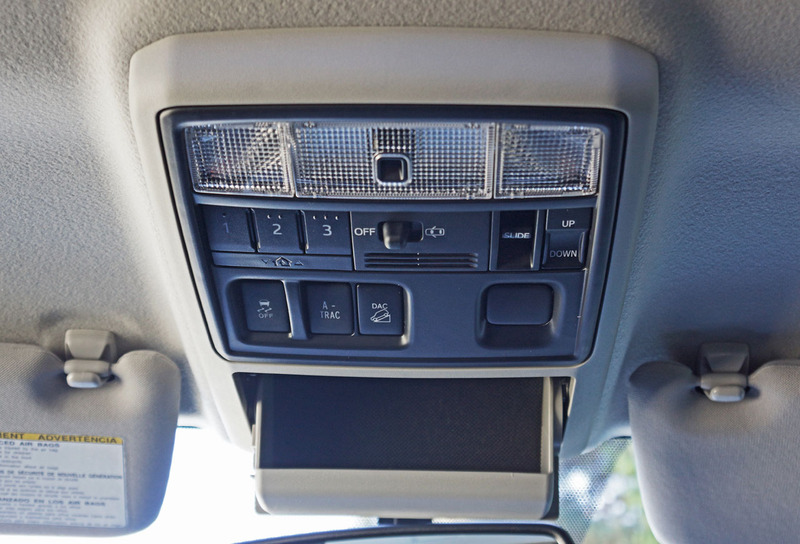 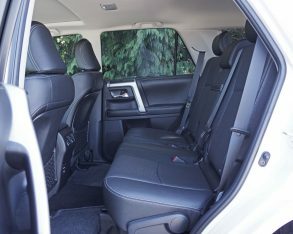 fit in quite easily with about an inch left over above my head and the same space ahead of my knees, so most teens won’t have a problem in the very back while smaller kids will likely love it. 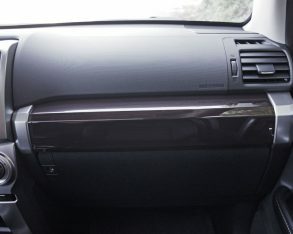 What’s even more impressive is the high quality mechanisms used for the third row’s construction. 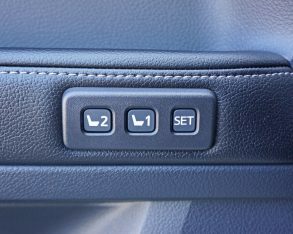 The bottom cushions slide underneath the cargo floor before laying the seatbacks flat, and they click together with a level of mechanical precision I rarely see in today’s auto sector. 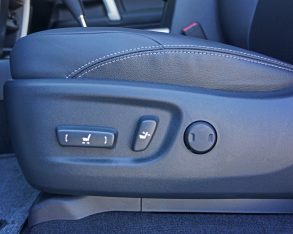 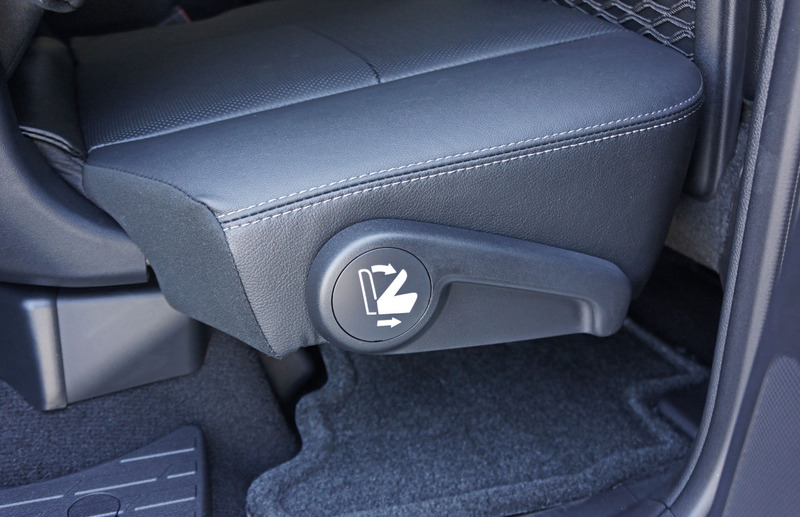 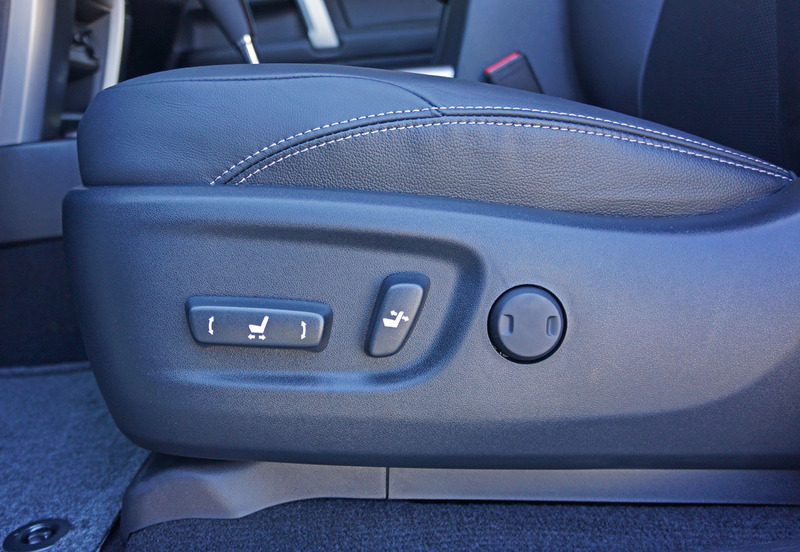 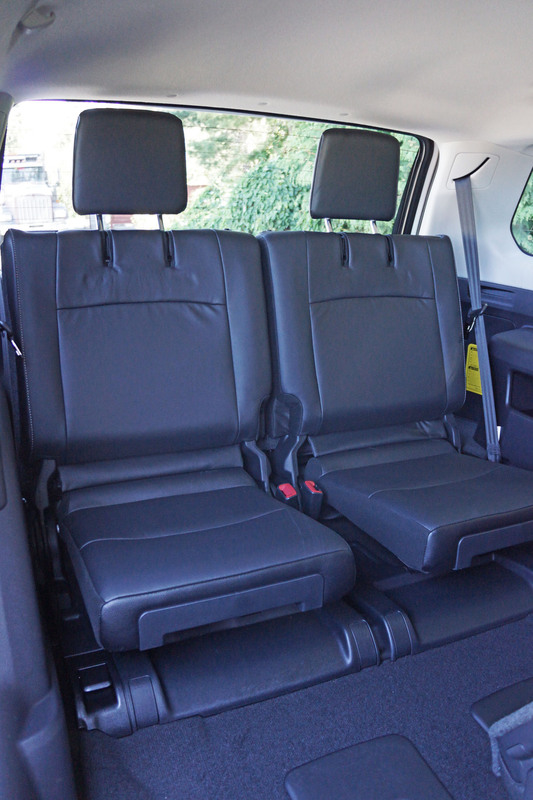 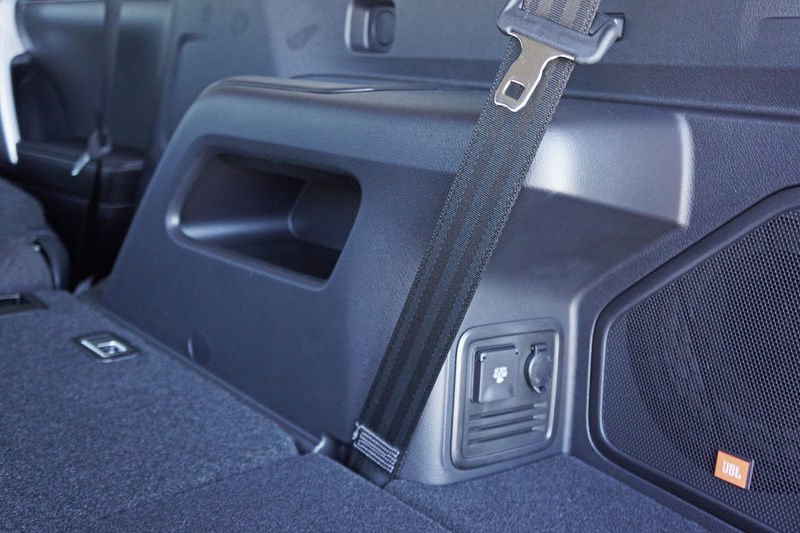 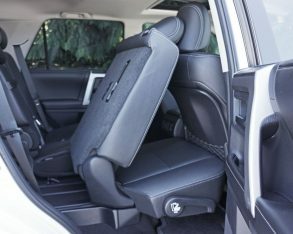 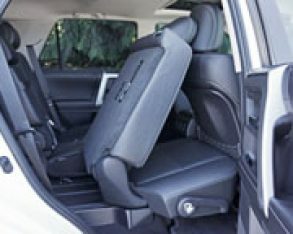 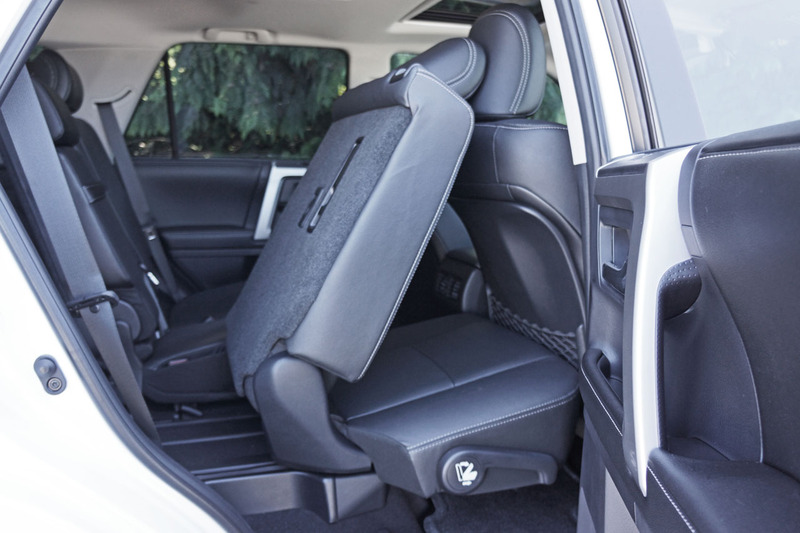 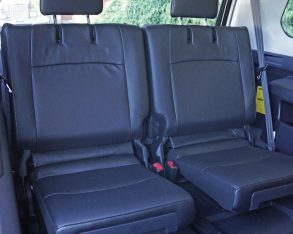 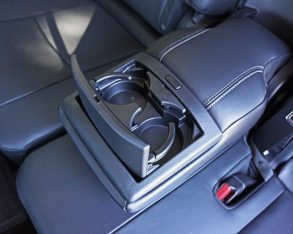 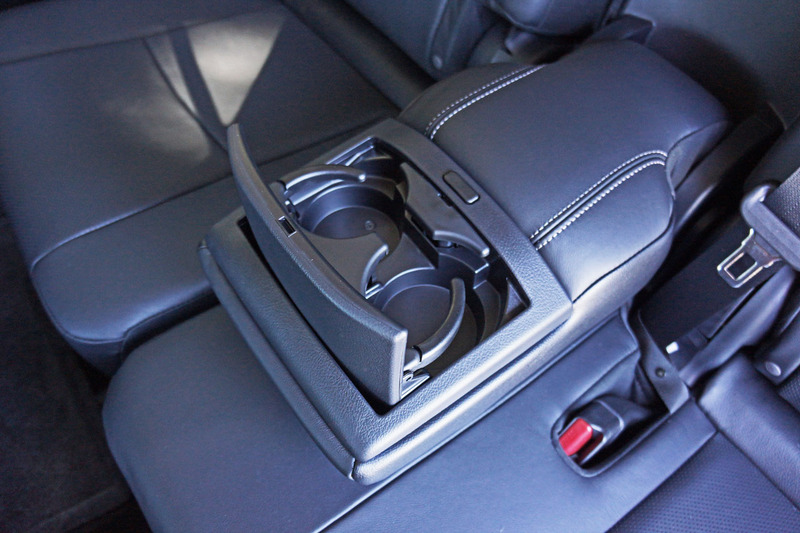 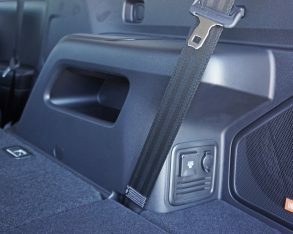 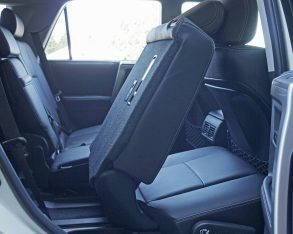 The seatbacks are sturdy too, which should go far to helping parents feel their kids are safely secured no matter where they’re seated. 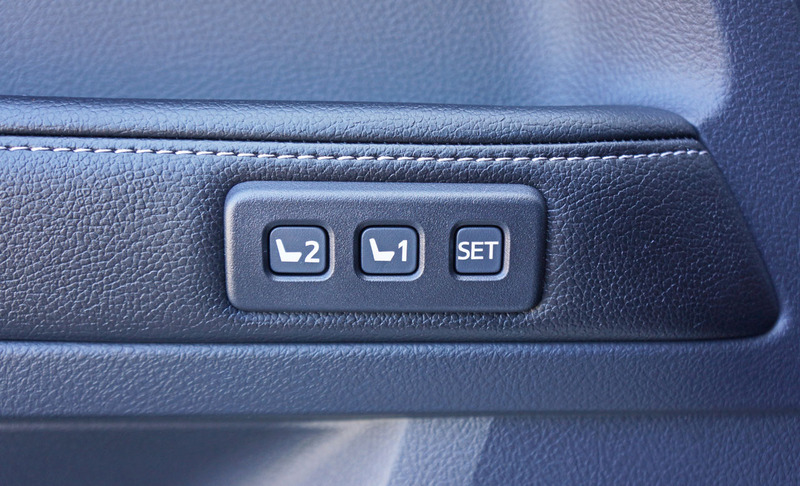 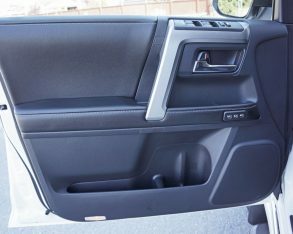 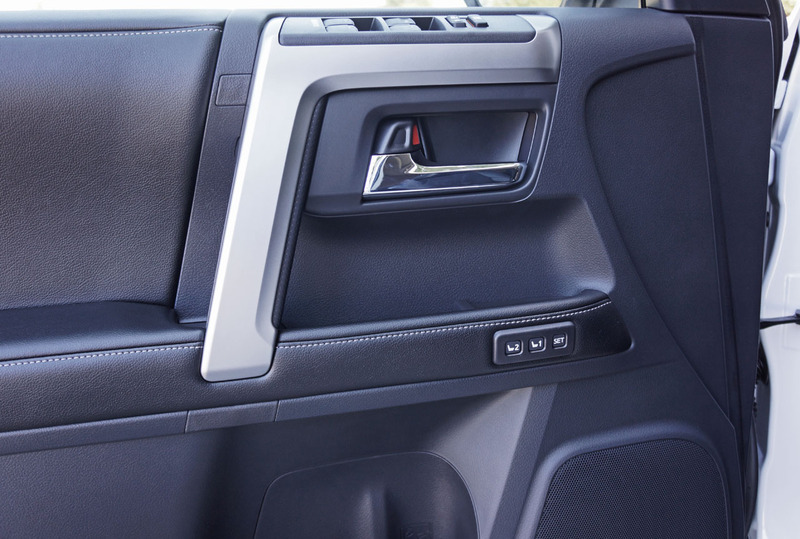 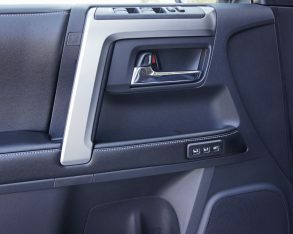 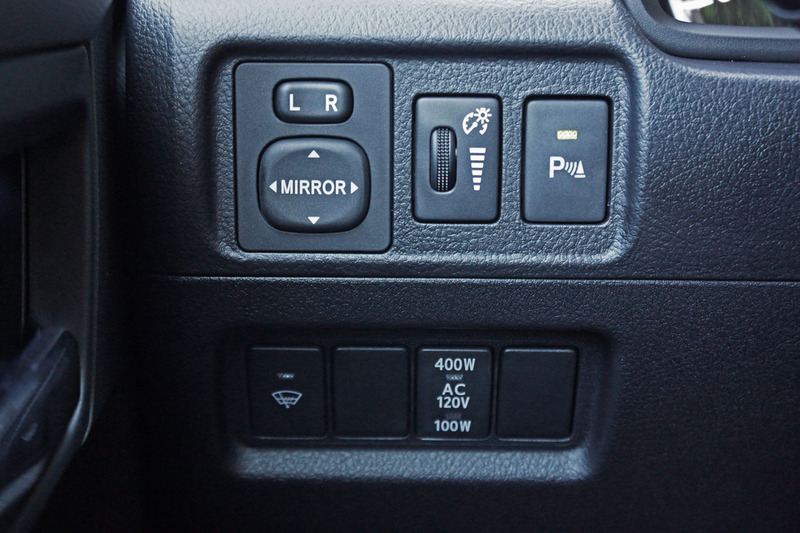 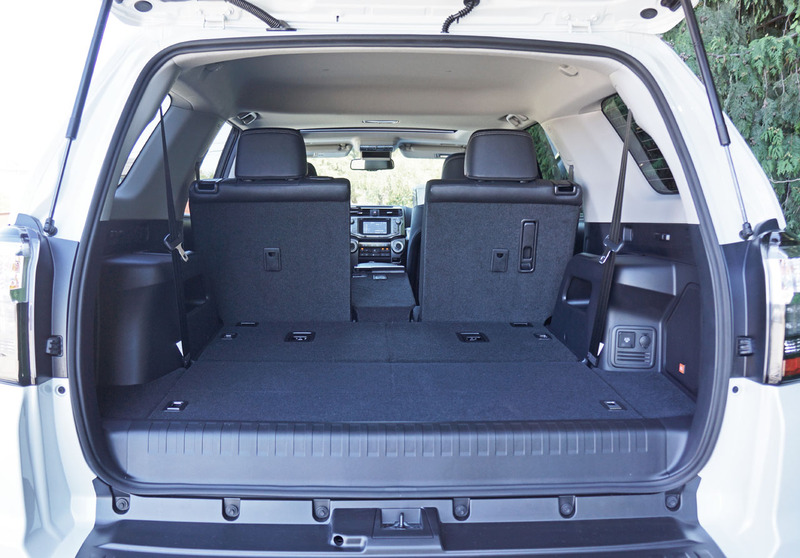 And believe me, I’ve experienced some third rows that were so poorly made that I wouldn’t let my kids use them, so to see this level of quality in the 4Runner makes me believe the rest of the truck is as solidly built. 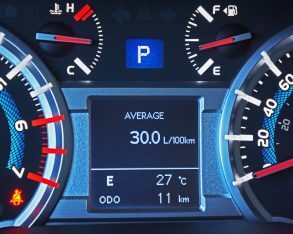 solidity nets an impressive payload of 771 kilos (1,700 lbs) and tow rating of 2,268 kg (5,000 lbs), while a somewhat tight 255 litres (9.0 cubic feet) behind the third row expands to 1,311 litres (47.2 cubic feet) behind the second. 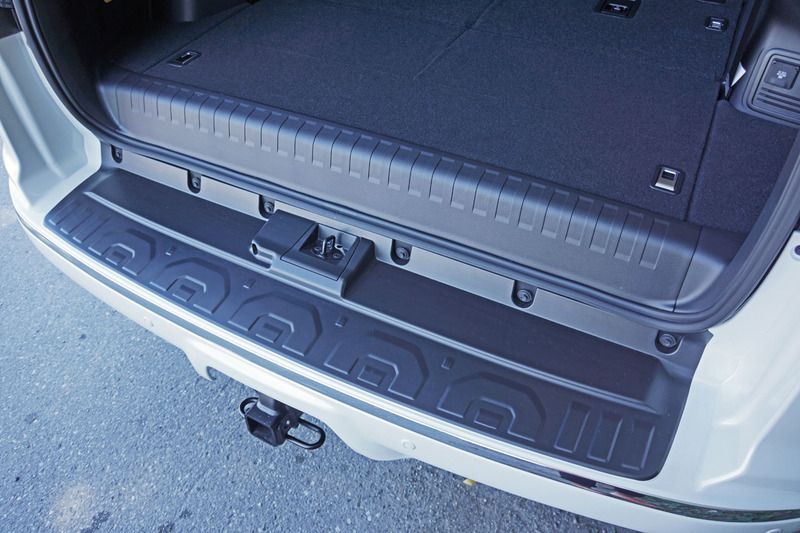 Drop all rows down, a relatively quick and easy process, and up to 2,540 litres (89.7 cubic feet) is at your disposal. 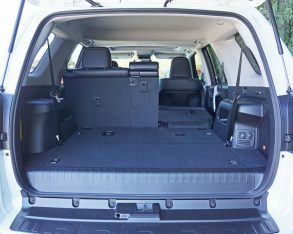 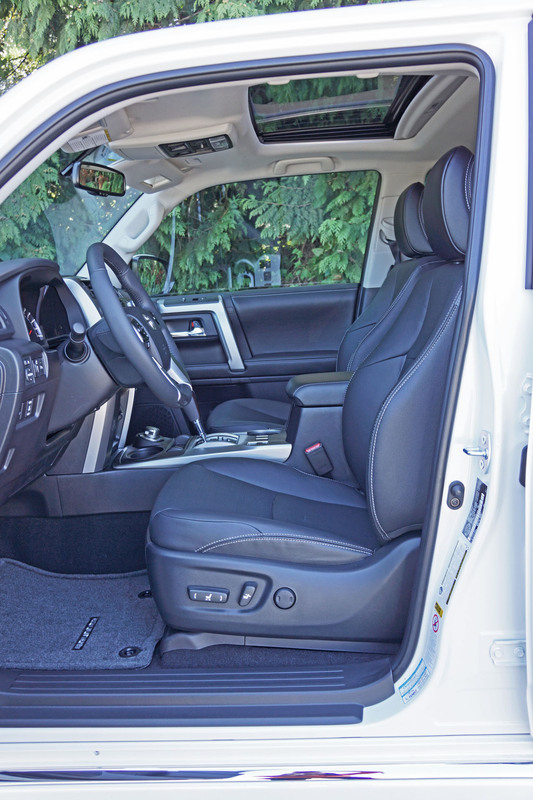 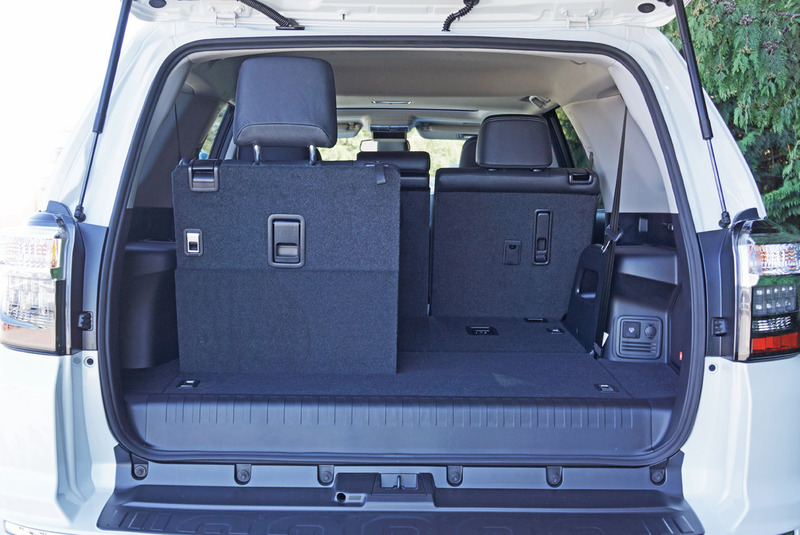 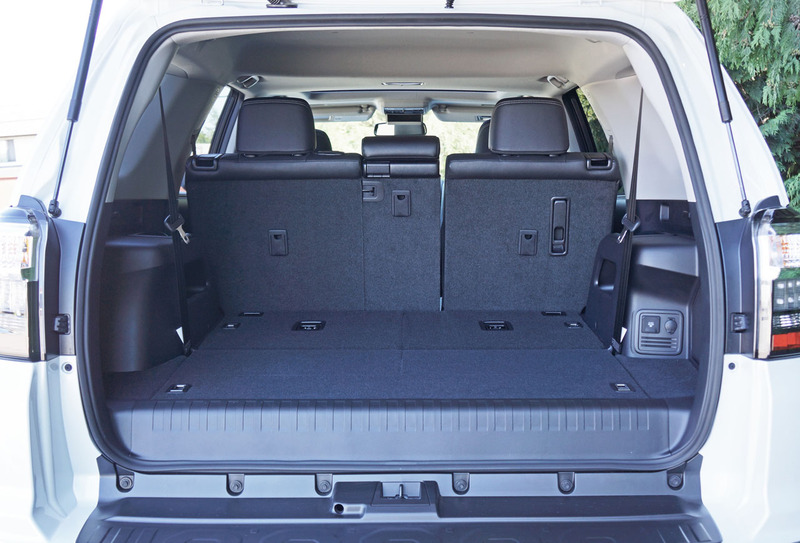 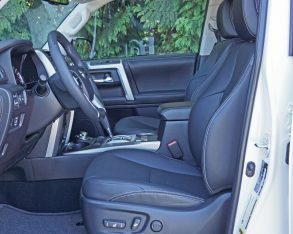 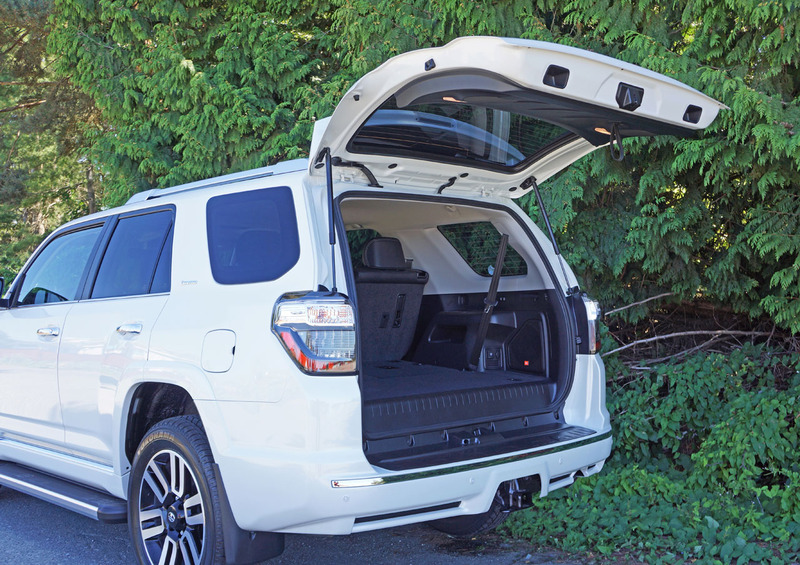 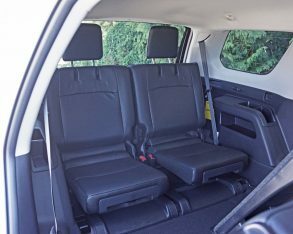 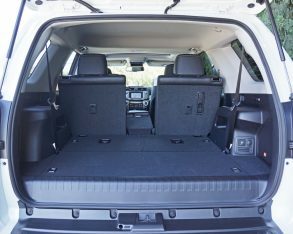 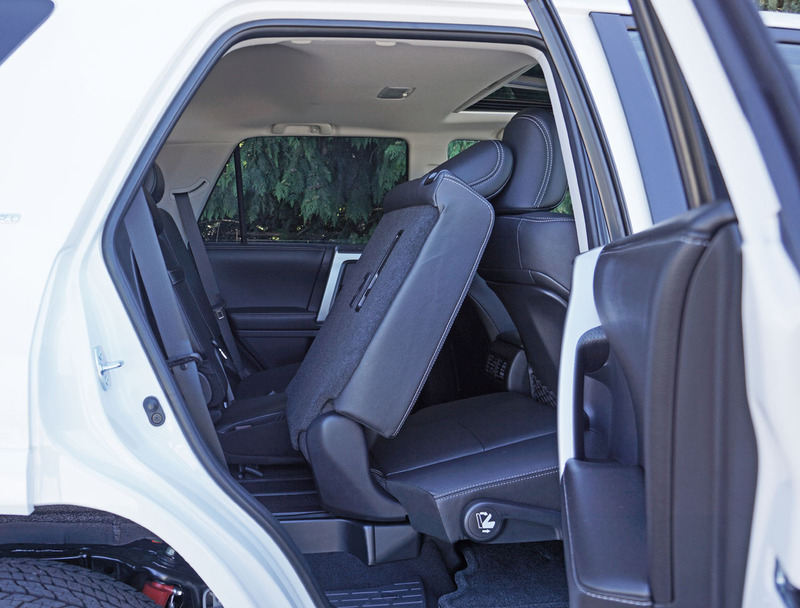 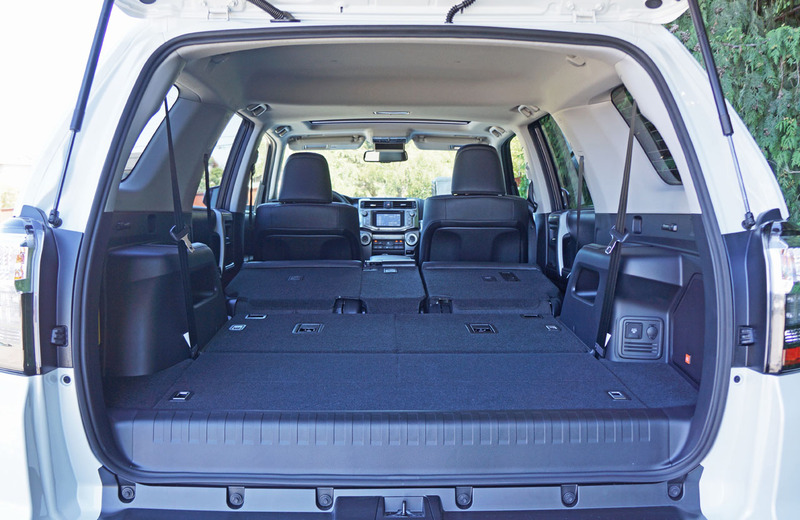 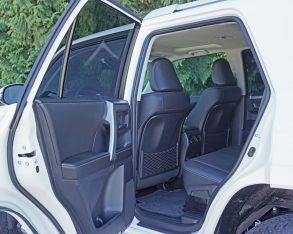 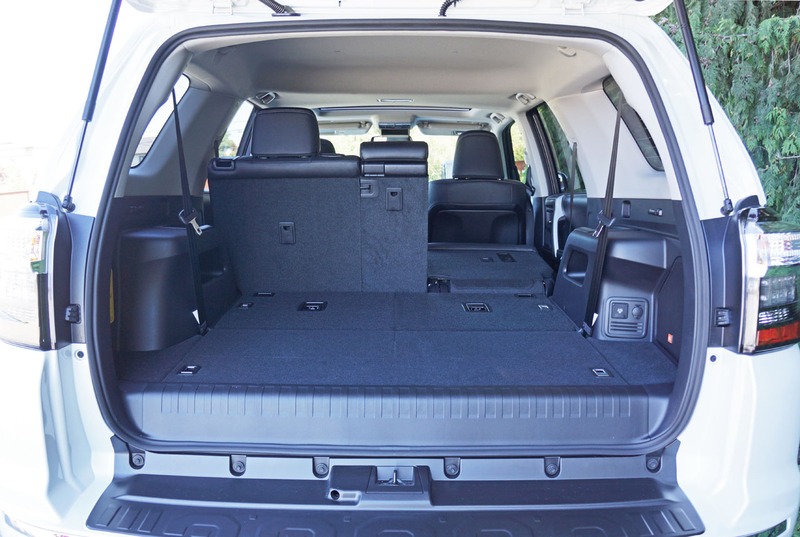 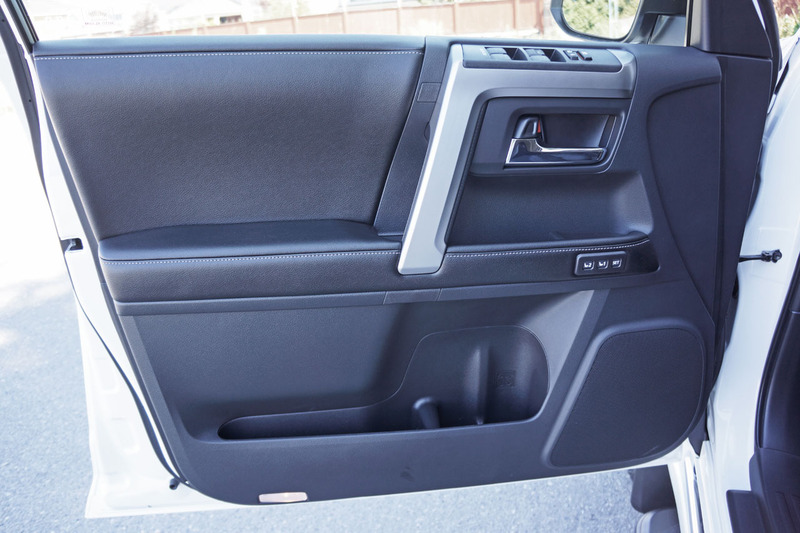 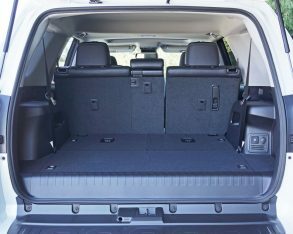 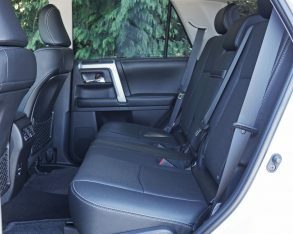 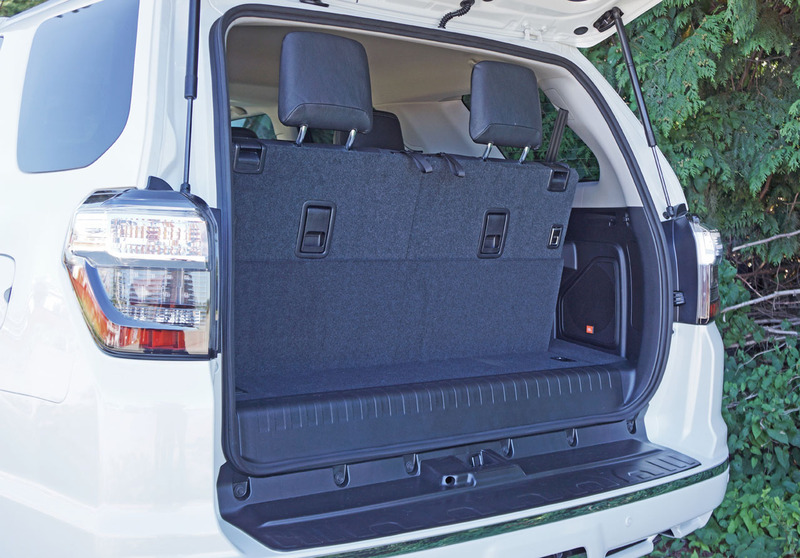 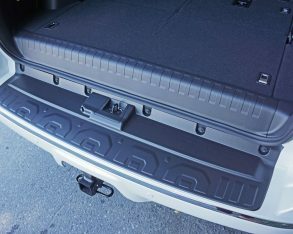 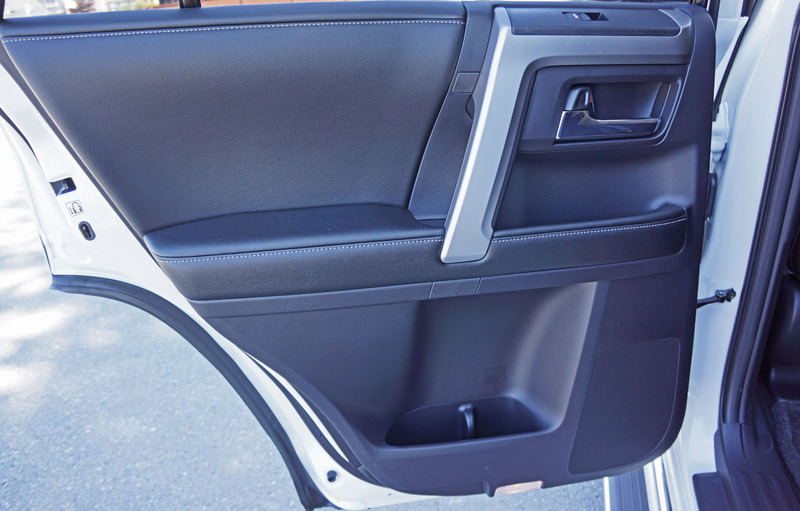 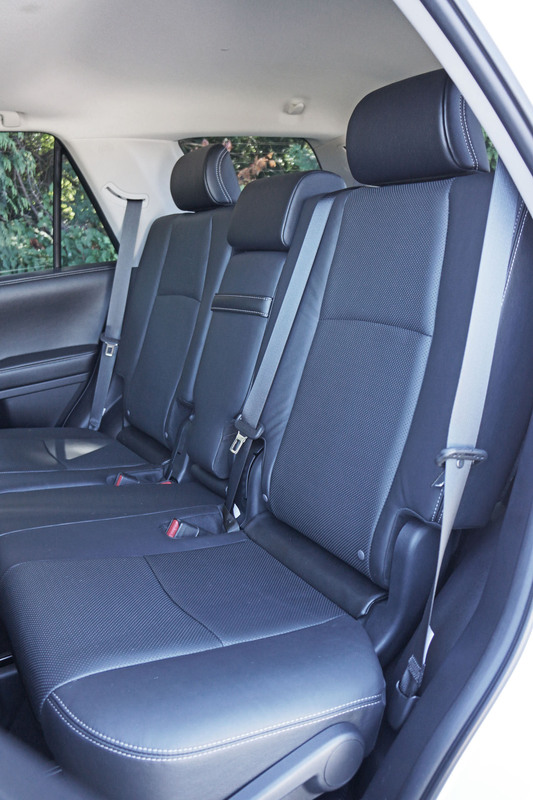 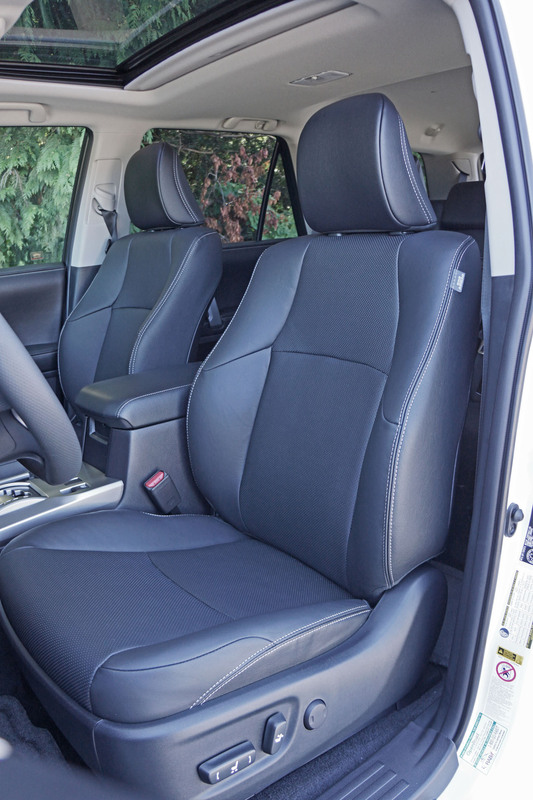 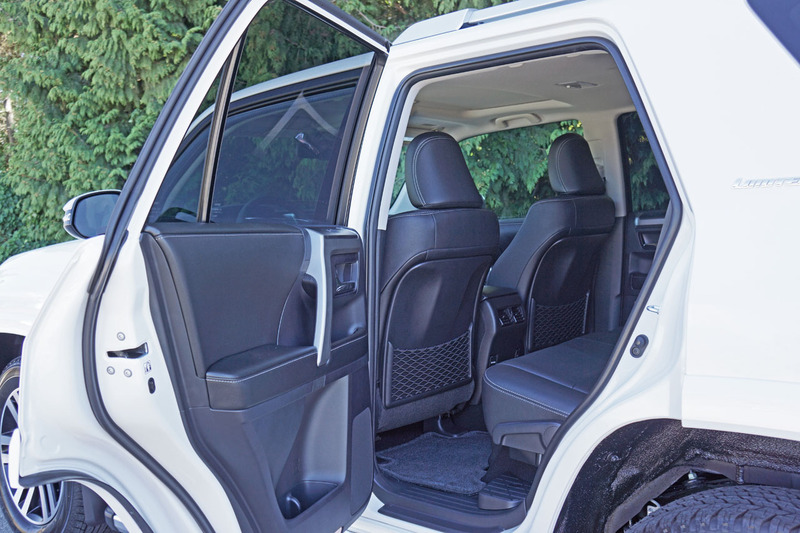 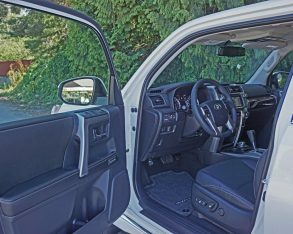 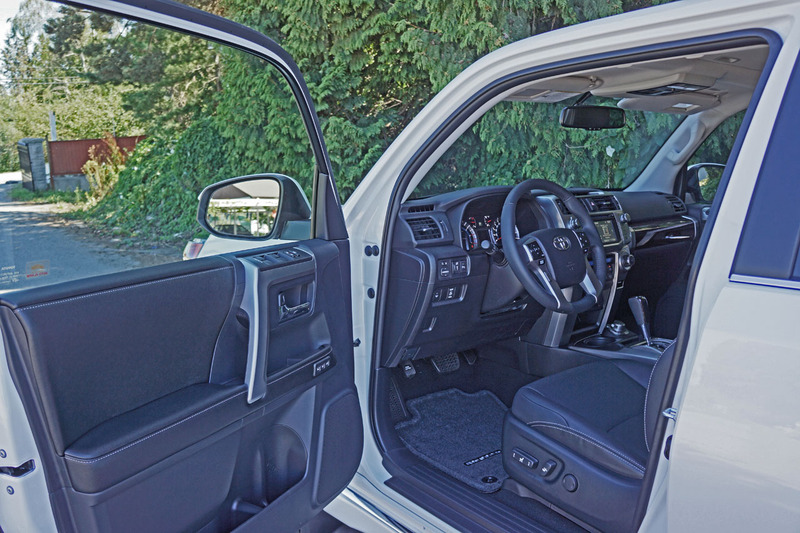 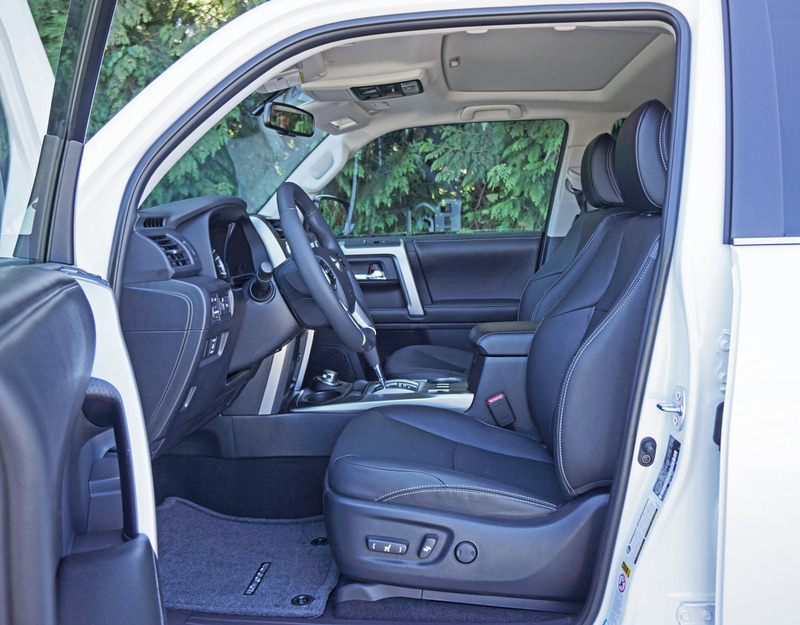 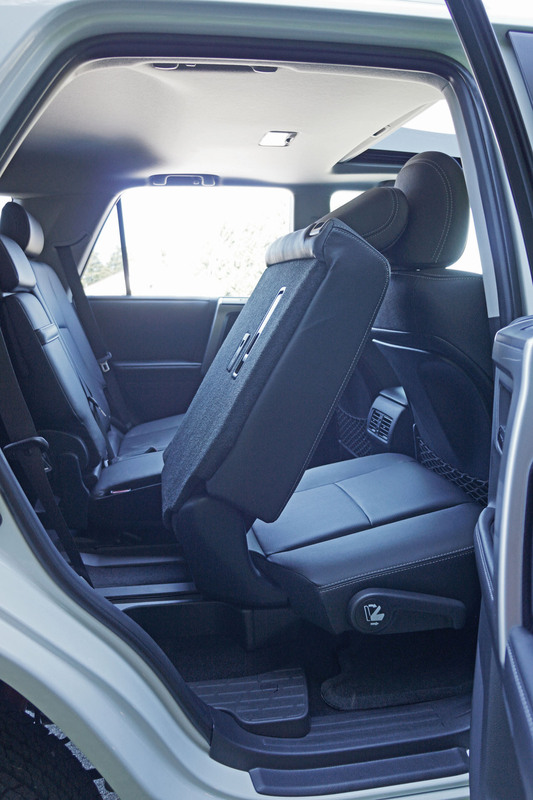 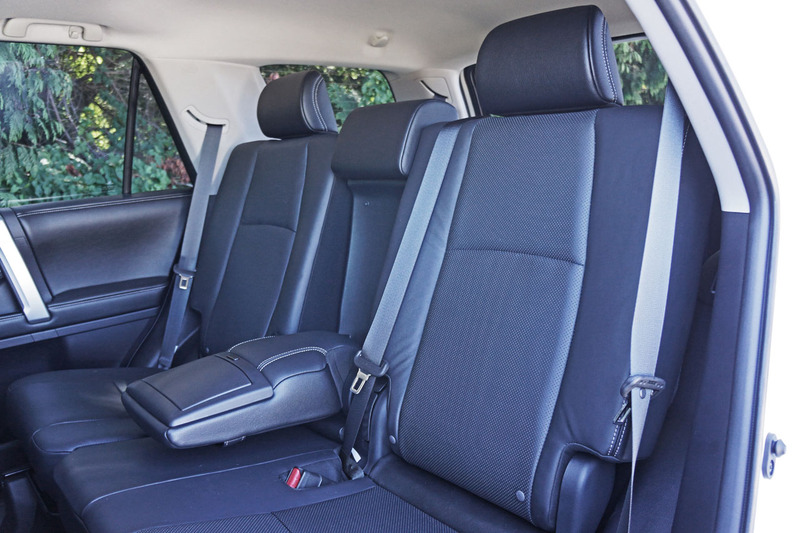 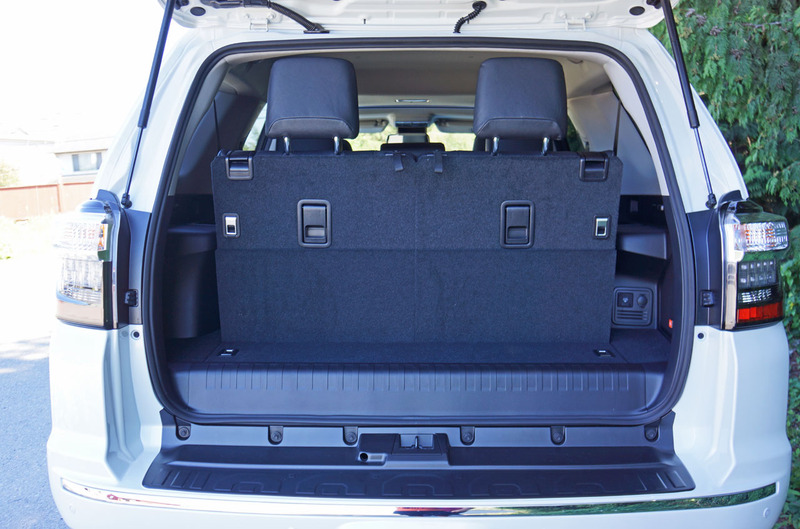 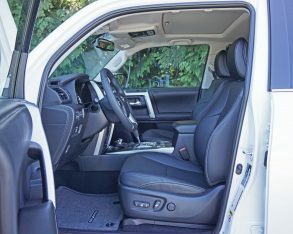 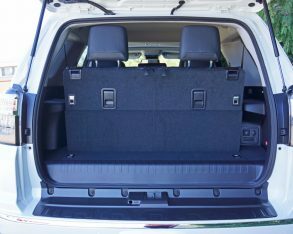 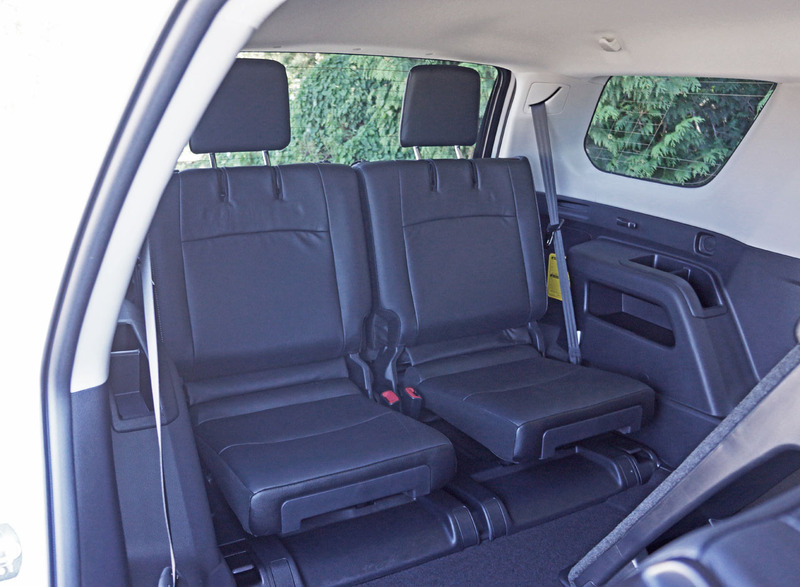 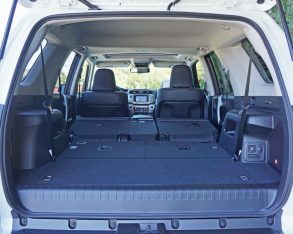 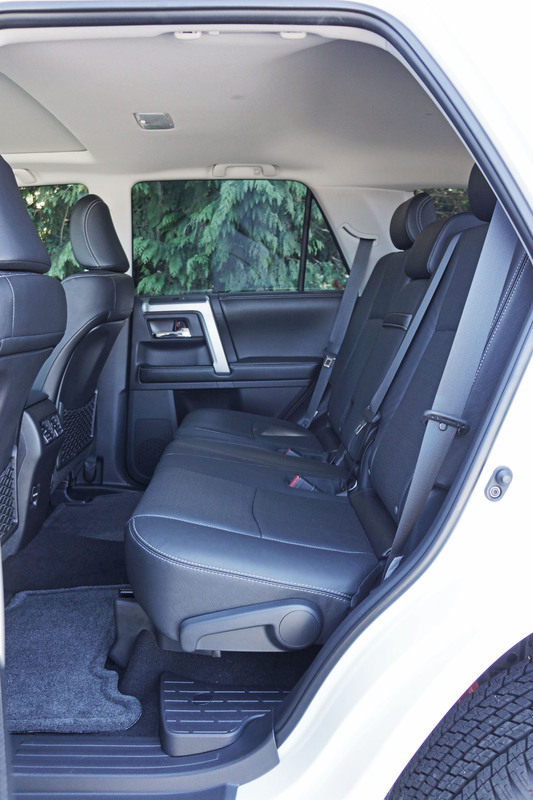 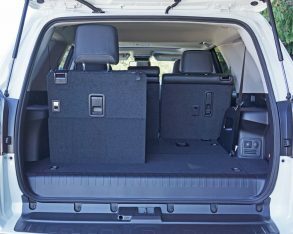 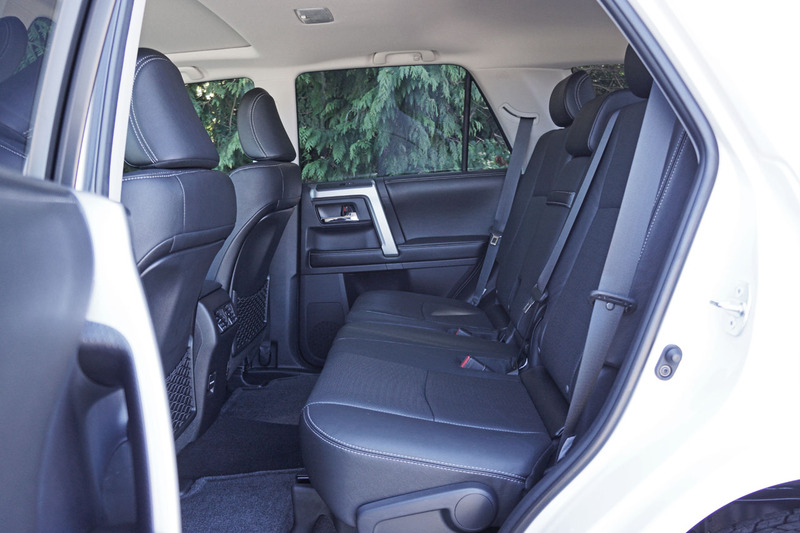 That’s a lot of room for your gear, while the way Toyota configures the second row, with a versatile 40/20/40 split, makes optimizing passengers and cargo ultra easy. 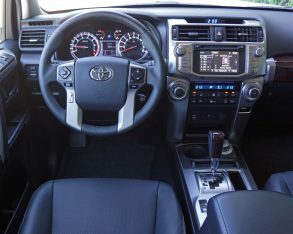 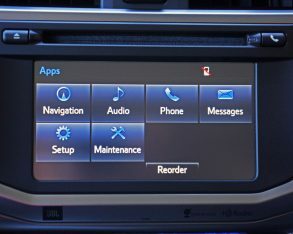 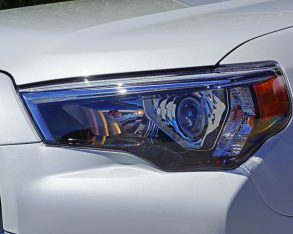 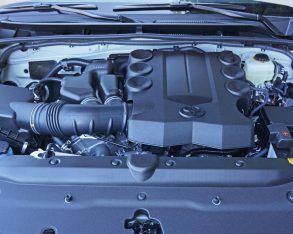 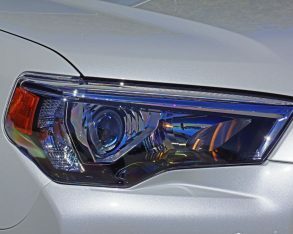 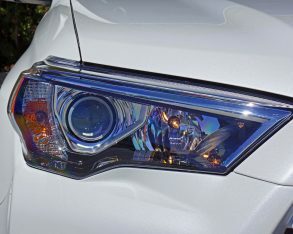 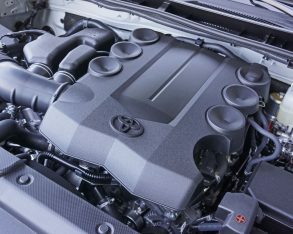 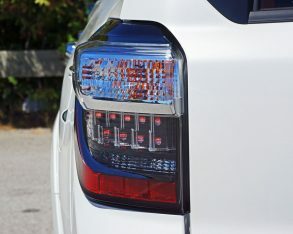 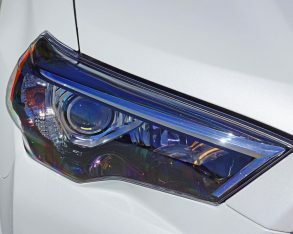 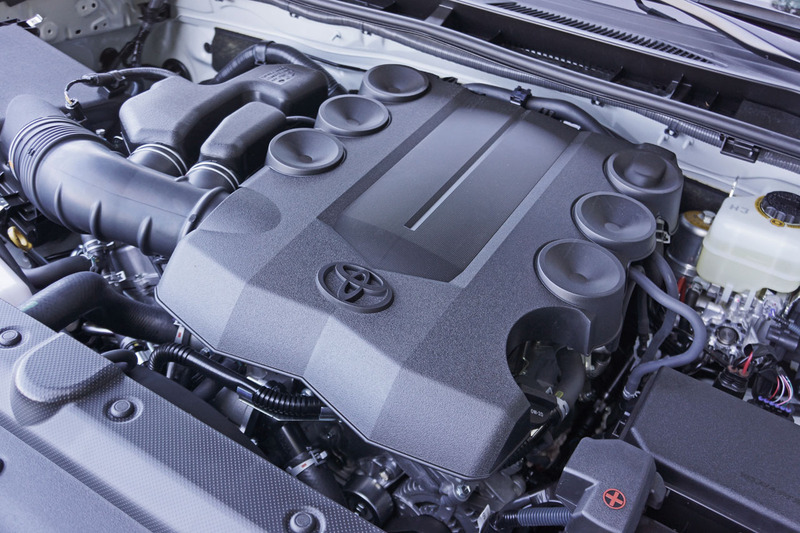 Toyota worked hard to improve the 4Runner’s efficiency for this fifth generation, with a redesigned platform architecture underpinning a stronger body structure made with higher strength steels, while an entirely new V6 replaced an outdated base V6 and top-line V8 with more power yet better fuel economy than both, the former improved by five percent and the latter by 17 percent. 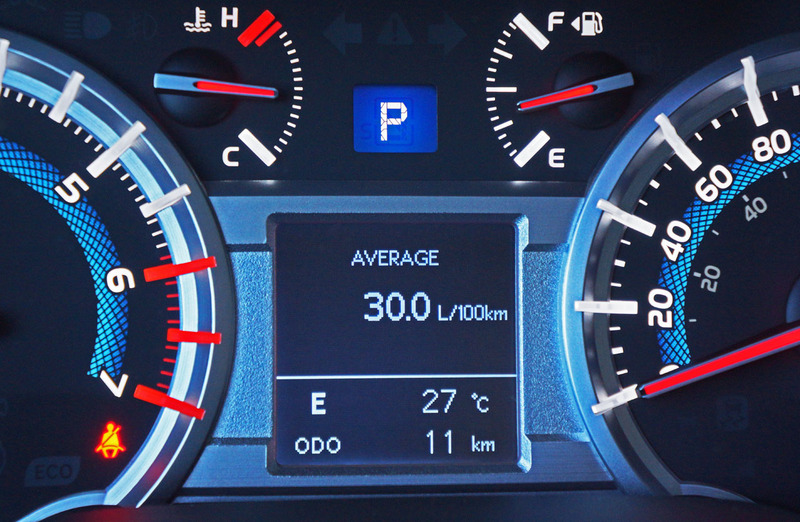 Drag was decreased by 10 percent too, so highway efficiency improved further, as did its quietness due to reduced wind noise. 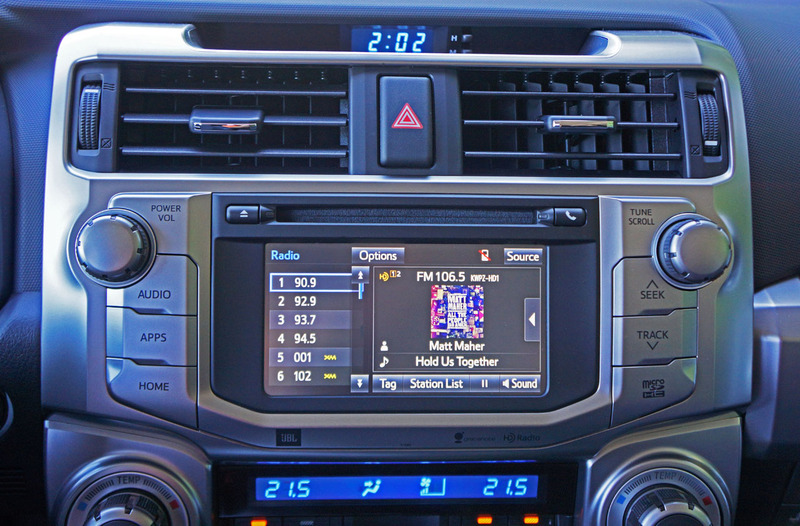 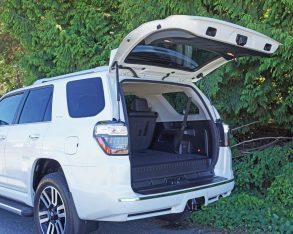 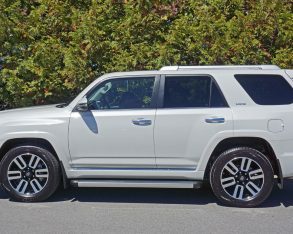 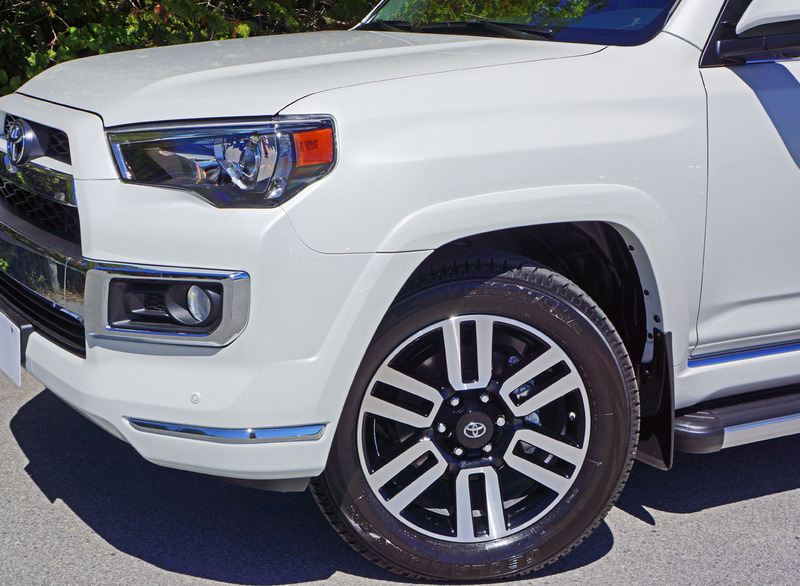 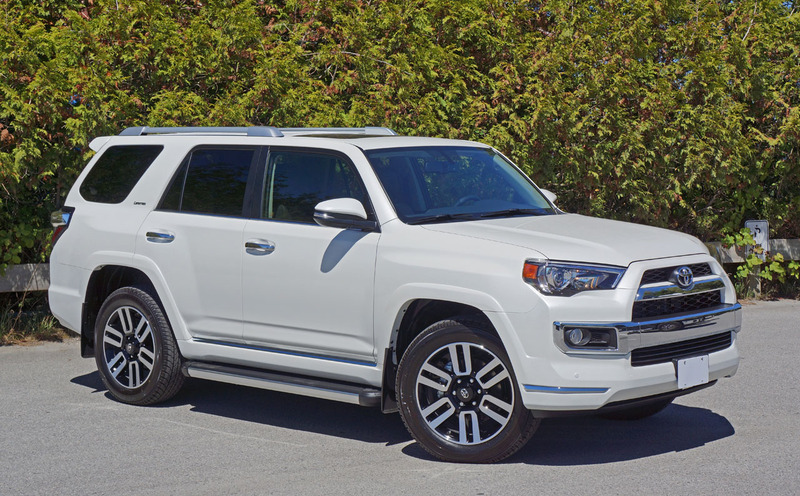 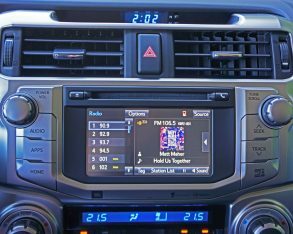 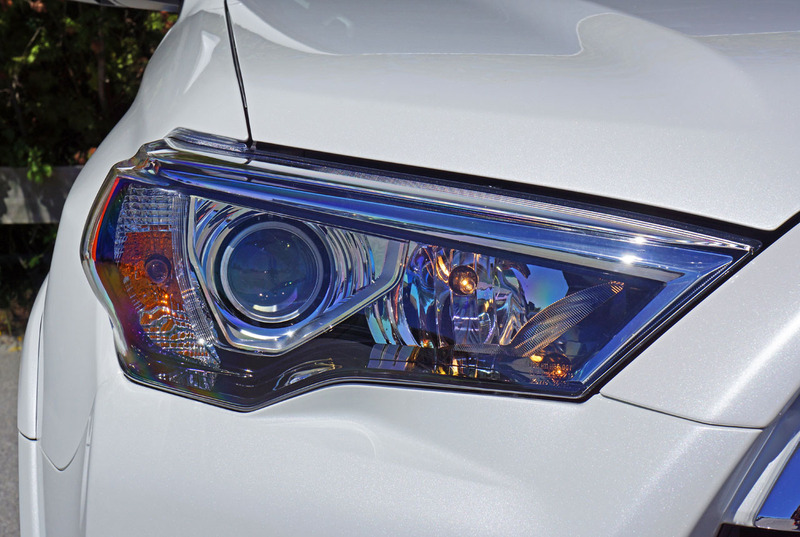 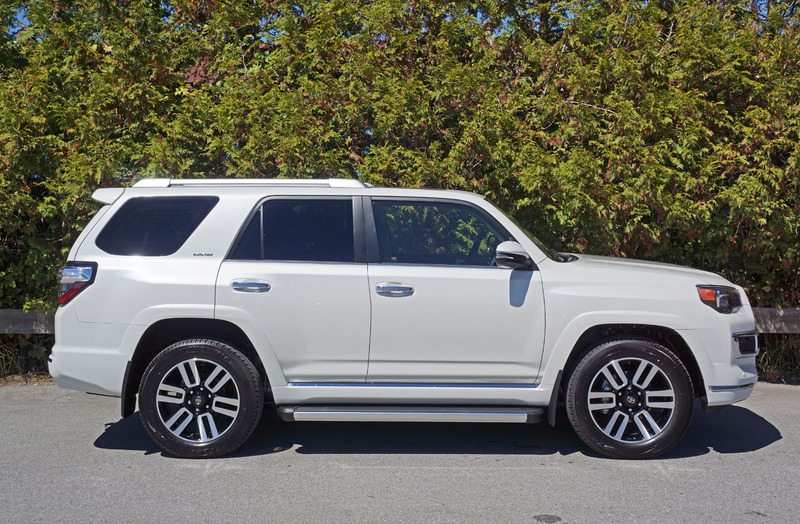 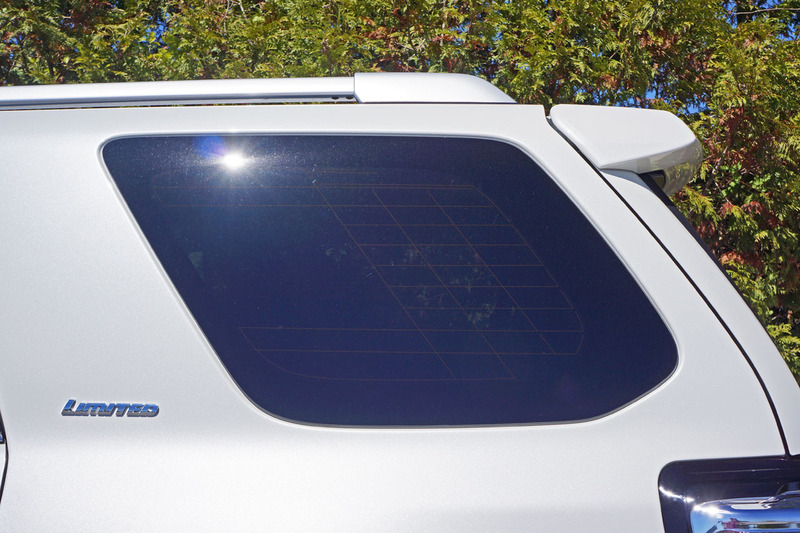 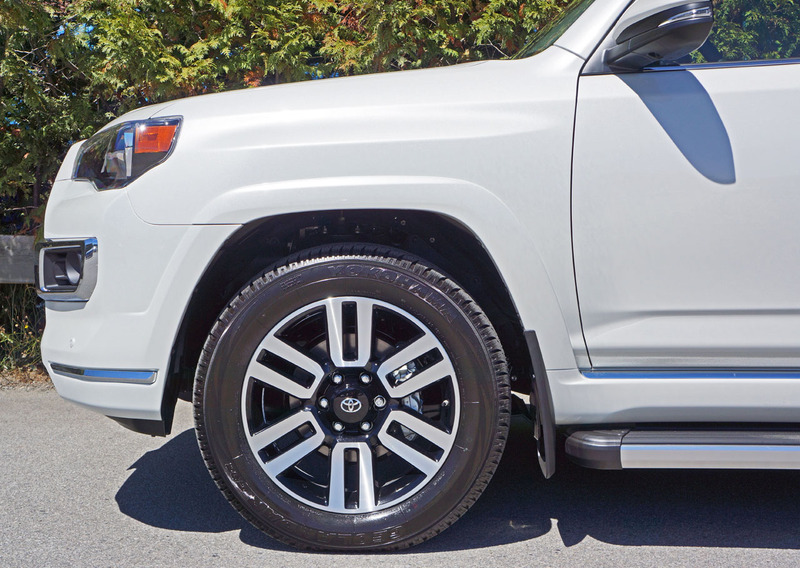 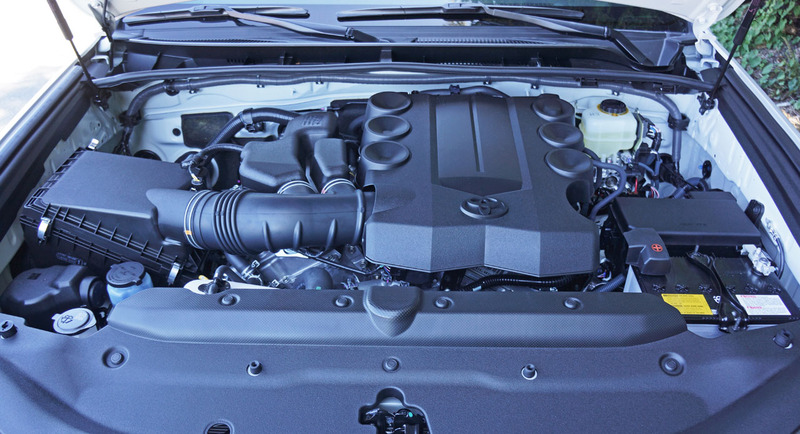 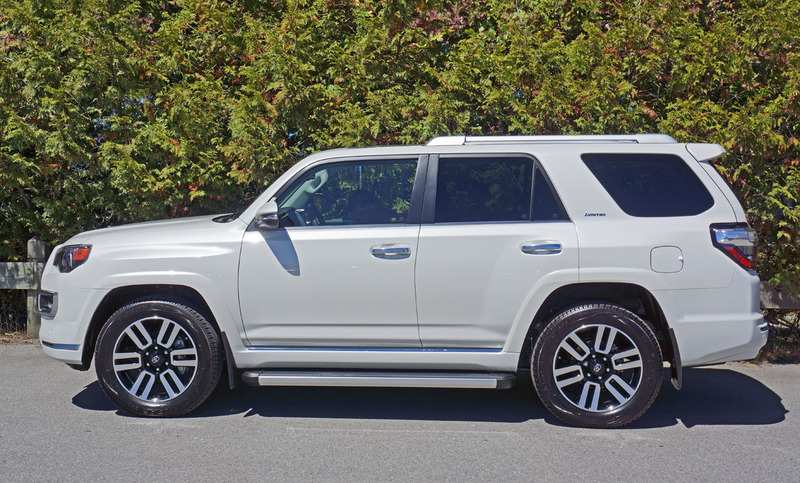 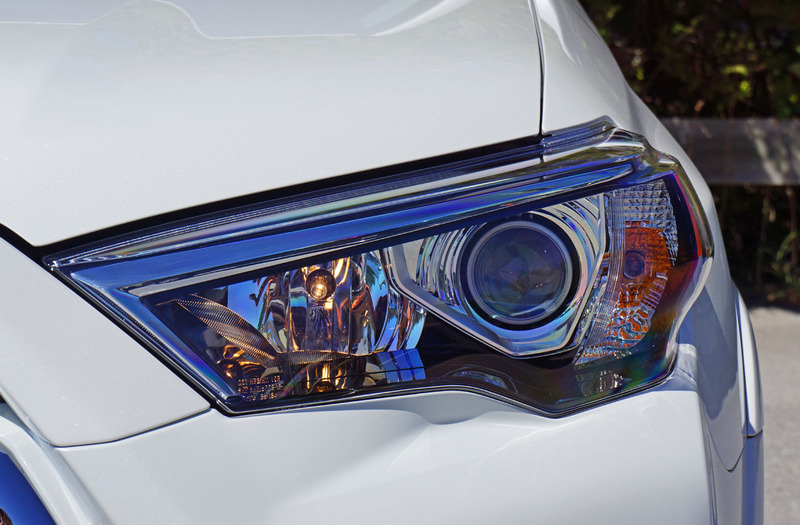 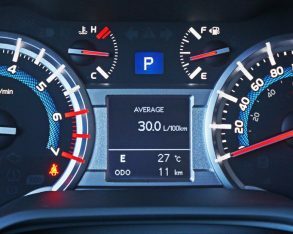 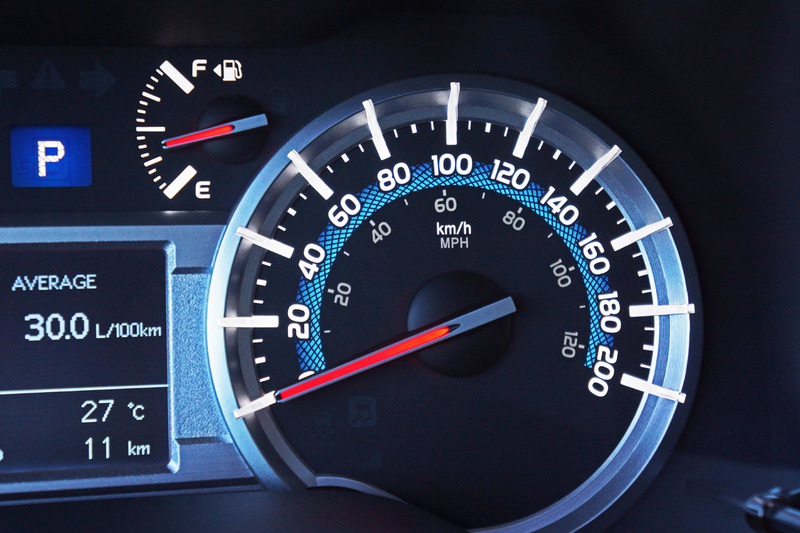 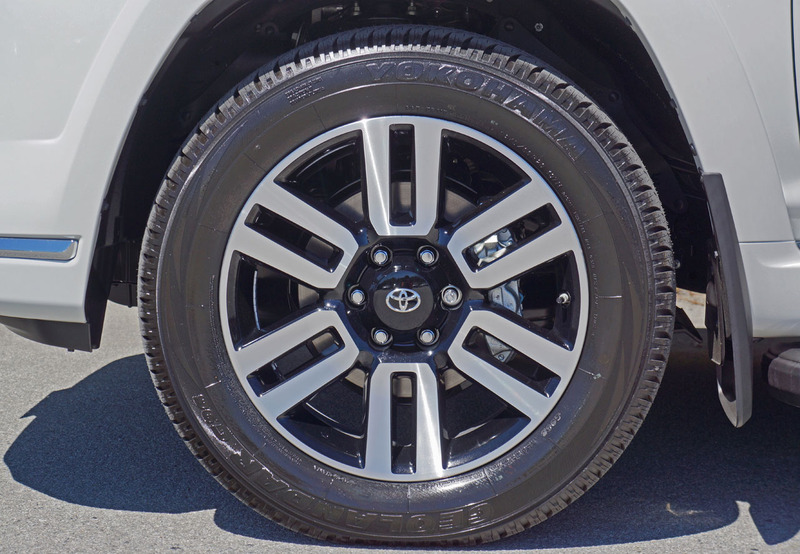 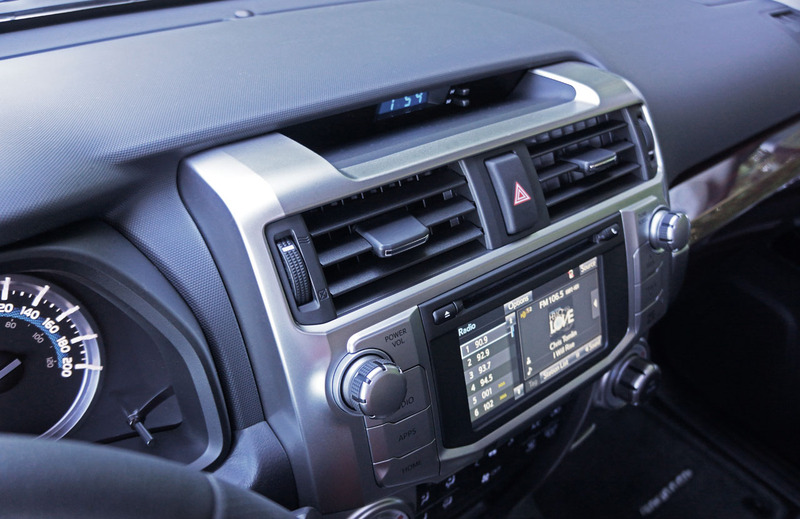 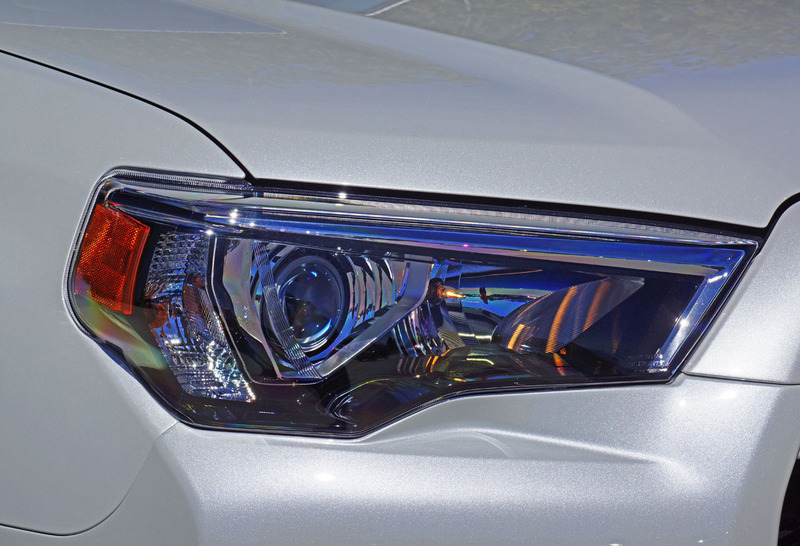 Continual year-to-year upgrades and the larger changes made last year for its mid-cycle upgrade only improved on the gains made in 2010, so today’s 4Runner is easily the best of its kind to date. 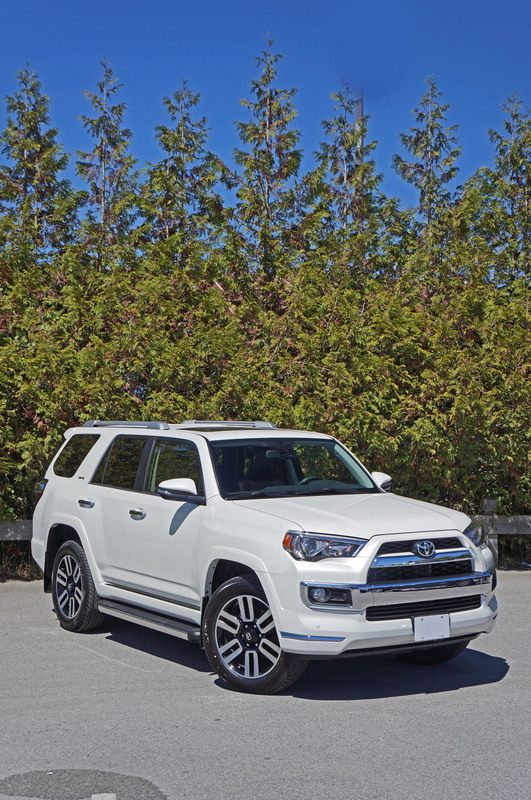 No wonder it’s sales grew so much last year and appear to be on an even more steeply raked trajectory for 2015.
one out for a ride and you’ll likely understand why the 4Runner is experiencing another wave of popularity. 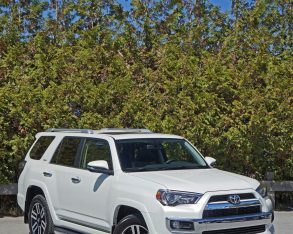 Compared to so many soft-roaders and 4×4 wannabes the 4Runner is the real deal, yet its so wonderfully comfortable and accommodating it makes a person question why we ever left true SUVs for the ever compromised crossover in the first place. 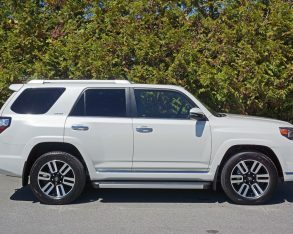 Don’t get me wrong as I’m a big Highlander fan too, but if my own money were making monthly payments it would be a 4Runner in my garage.